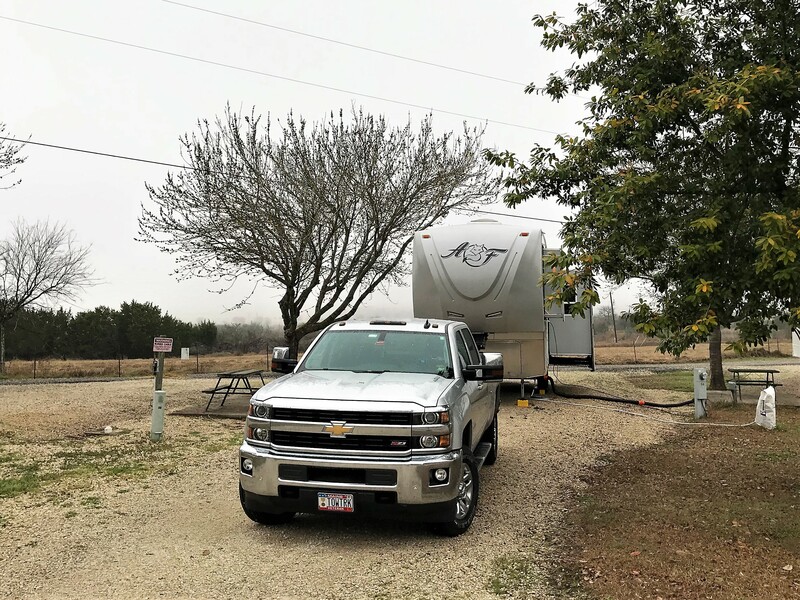 Thursday, January 31, 2019: Departed the RV Park at Fort Sam Houston Army Base in San Antonio, Texas and headed north on I-35. Wait, what, why back north? 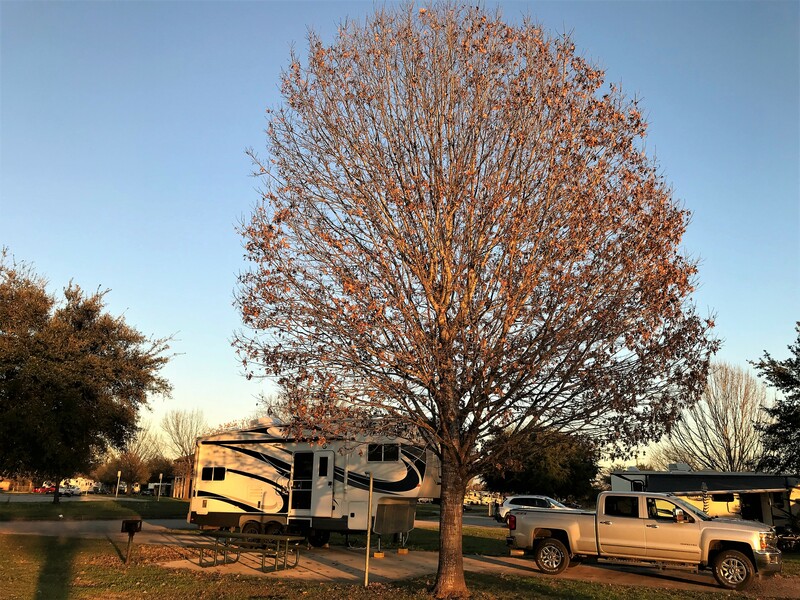 Well, we had planned to stay in the area for about two weeks, but we could only score five nights at Fort Sam, so our Maine RV’ing friends invited us up to their wintering over park in the town of San Marcos. Canyon Trails RV Park is conveniently located and nestled in farming country. We choose an end site that was backed up to a nice meadow where a herd of deer visited each evening. The high humidity helped the newly mown fields give off the fresh and fragrant smell of the rural countryside and a distant rail corridor added a nice backdrop of trains rumbling through while blowing their whistle at road crossings. 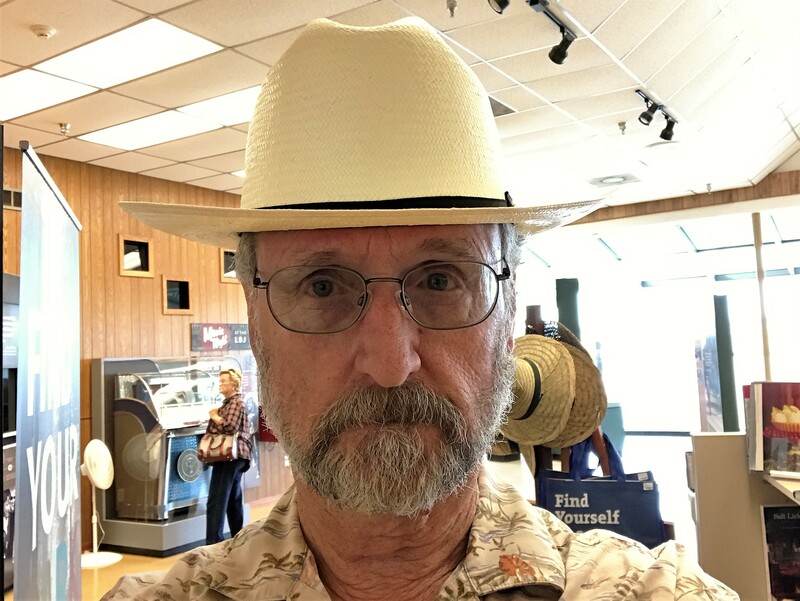 Glad we are here…Kit and I are looking forward to exploring more of this interesting corner of America. 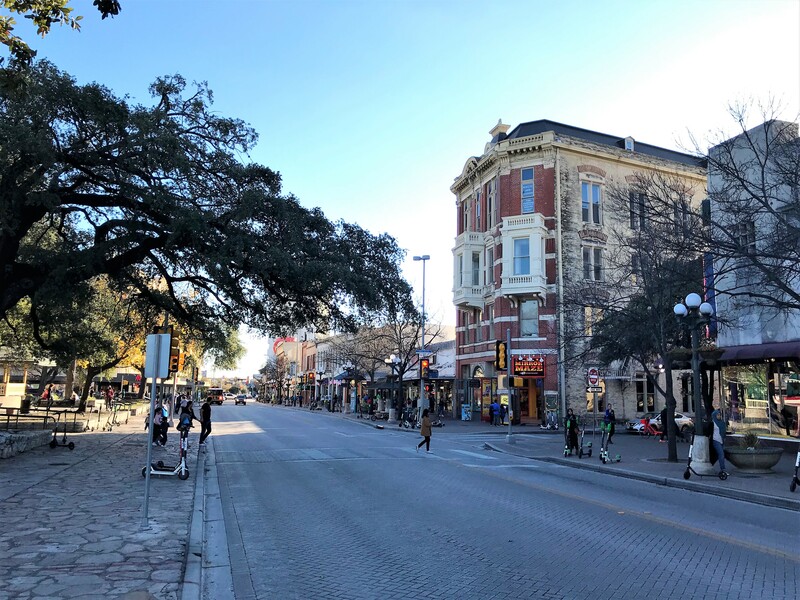 Friday, February 1, through Thursday, February 7, 2019-San Marcos, Texas: This town is nestled between the larger communities of Austin to the North and San Antonio to the South. 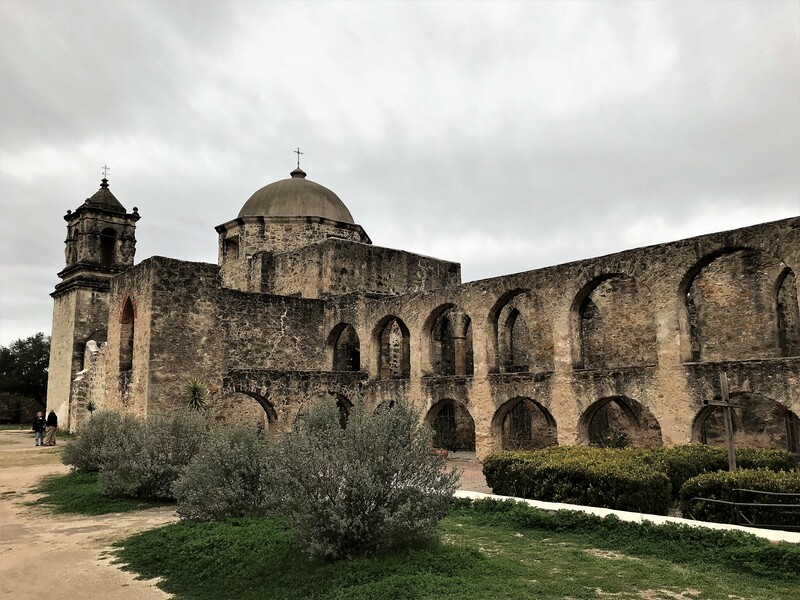 Located on the banks of its namesake River, San Marcos is believed to be one of the oldest continuously inhabited sites in America. 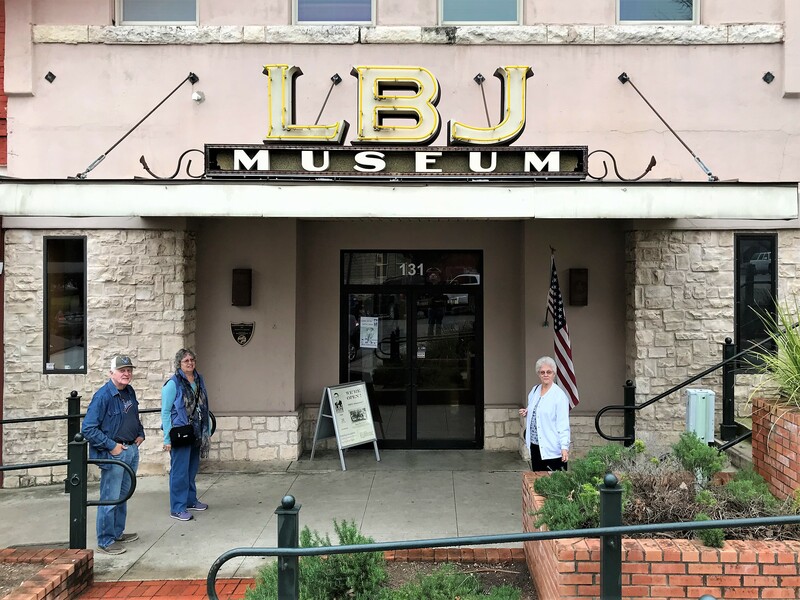 Home to Texas State University, San Marcos is where Texas native son Lyndon Baines Johnson received his undergraduate teaching degree, so its fitting there be a small museum depicting his early life. 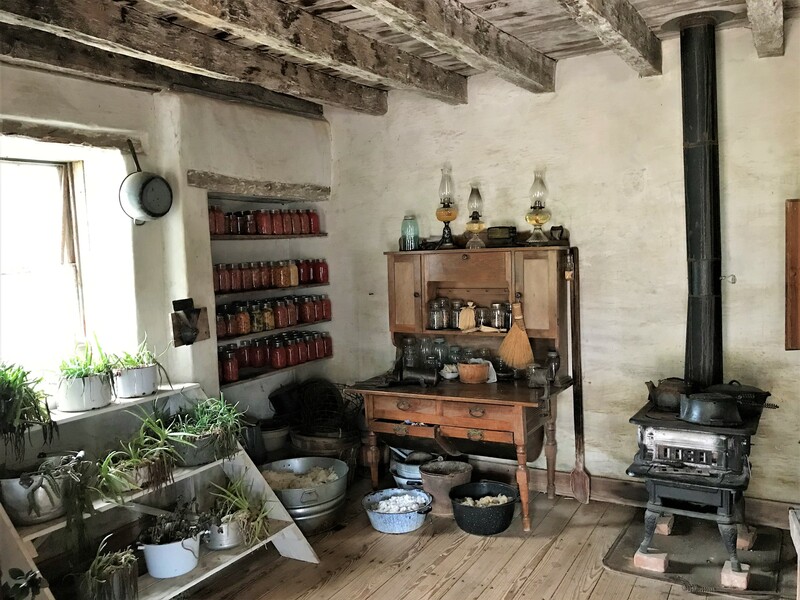 Which we toured one day with Rey and Darlene…and, which piqued our interest in roaming afield later in the week to visit the Johnson Ranch, sixty miles to the west. During our stay, the annual NFL sports spectacle and, generally more entertaining creative television commercial airing, was being televised from Atlanta. 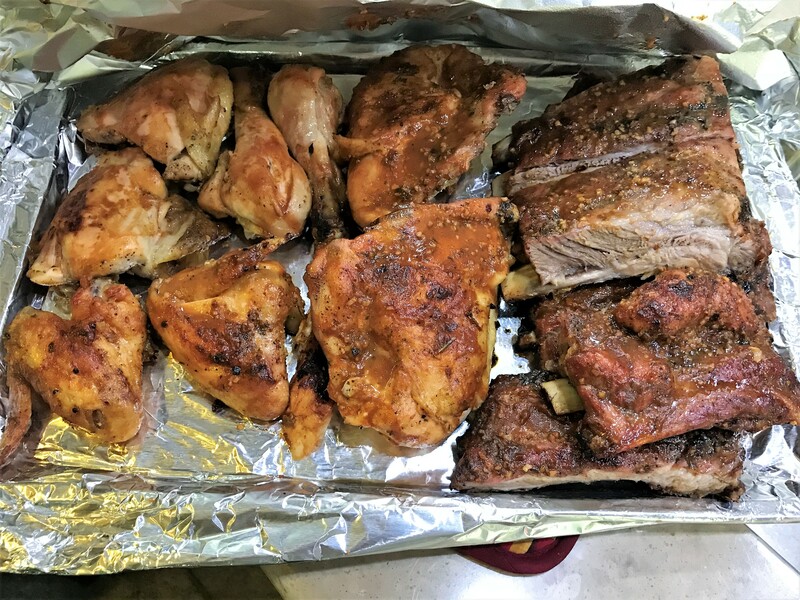 Kit and I are not big sports fans, but we are fans of delicious eating which we enjoy during the annual ritual of munching on snack food while watching the Super Bowl commercials. …while watching the game from their outdoor television housed in one of the camper’s storage bays. Keeping with tradition to photograph the better meals that Kit and I enjoy on the road, here is a photo of my first helping…or was it my second…or, possibly my third? 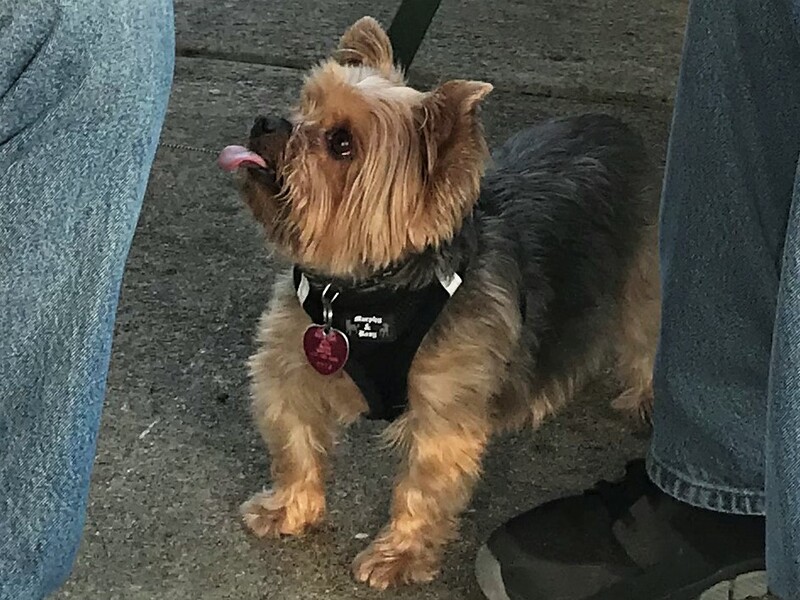 …shown above displaying his displeasure. 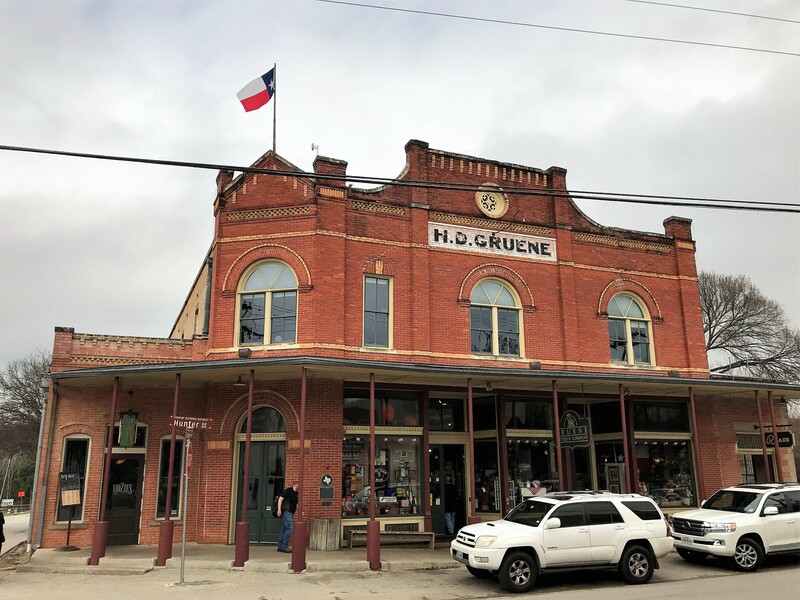 A nearby village that Kit and I have enjoyed in the past, and visited again this trip with Rey and Darlene, is Gruene, Texas. 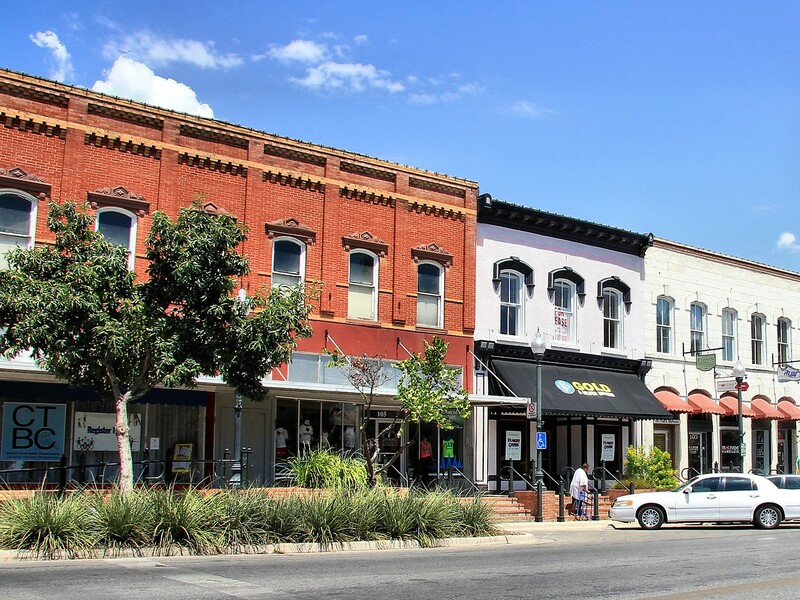 Established by German settlers along the Guadalupe River, Gruene (pronounced green, presumably because of all the green that passes into the local merchant’s coffers) became an important cotton producing region with a small commercial district to support the farmer’s needs. 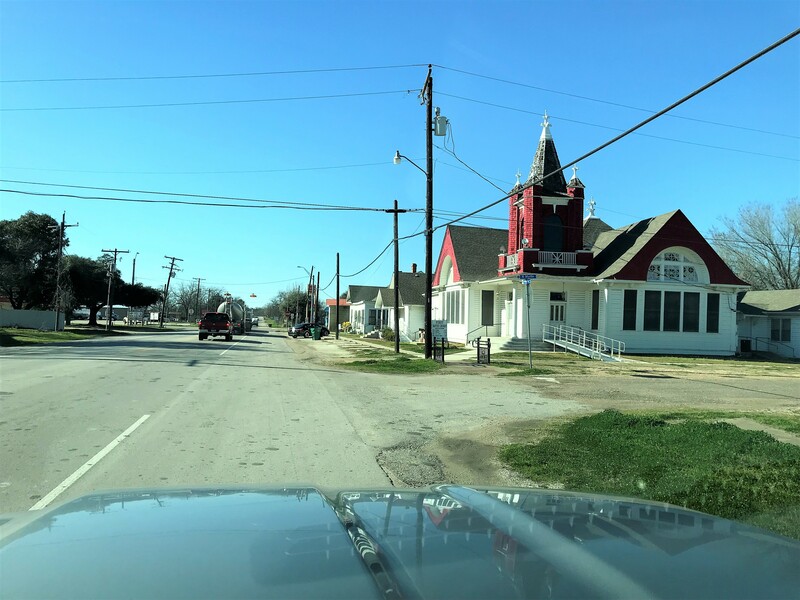 Unfortunately, the Boll Weevil infestation followed by the Great Depression decimated the area and reduced Gruene to a ghost town. 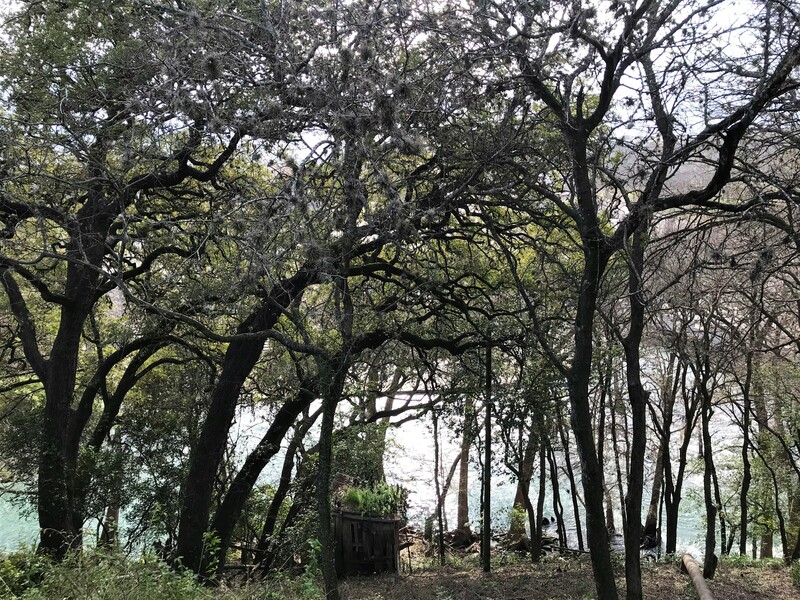 However, fortunately, a young architecture student noticed the dilapidated town while on a kayaking adventure and decided to document the remaining structures for a school project. 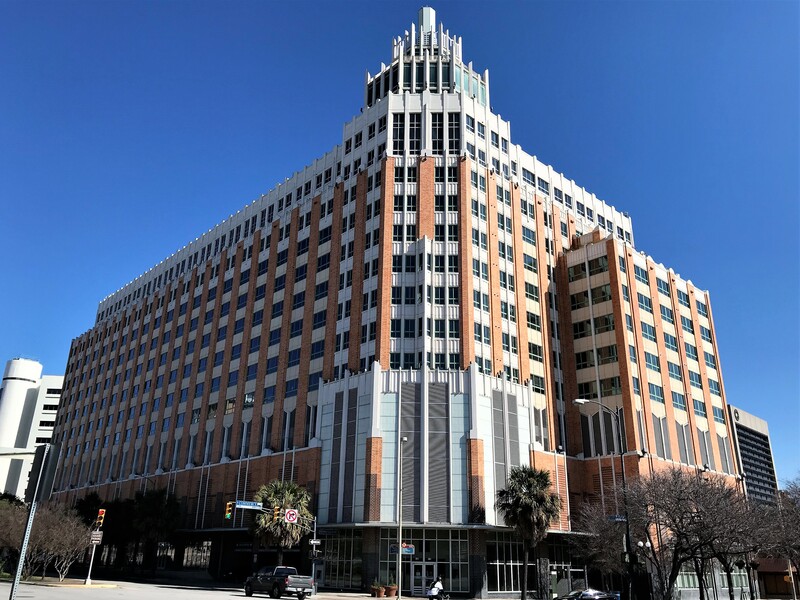 During his efforts he also discovered that developers had purchased the town and intended to tear down the historic buildings to build riverfront condominiums. 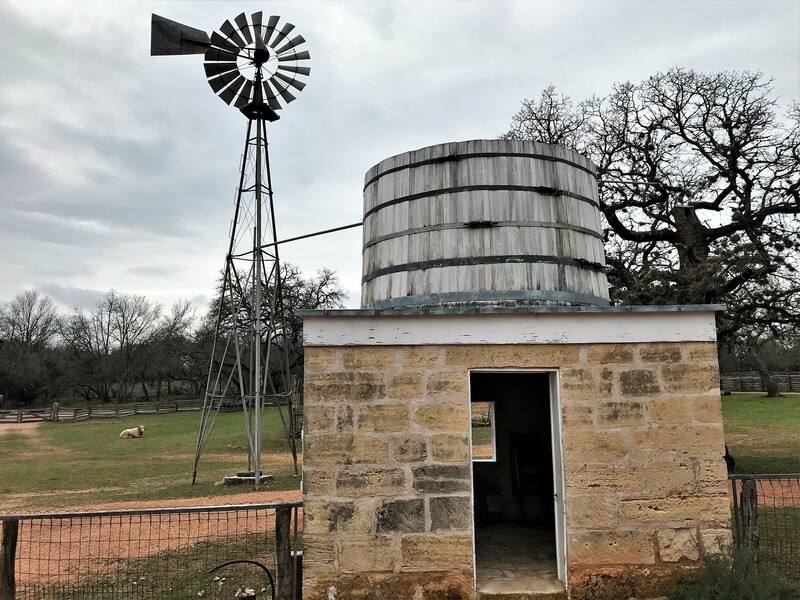 Expanding his study, the architecture student convinced the developers of the economic advantage of a historic center in their development plans and many of the old structures were saved and restored…such as the former water powered cotton gin, now a popular restaurant. 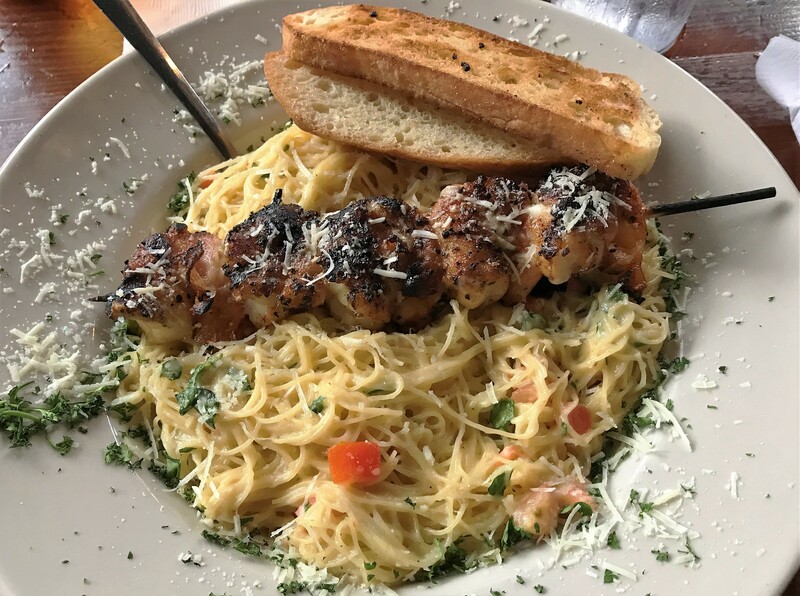 …such as my pasta dish topped with bacon wrapped Gulf shrimp on a skewer. One of the best meals of this year’s trip so far! 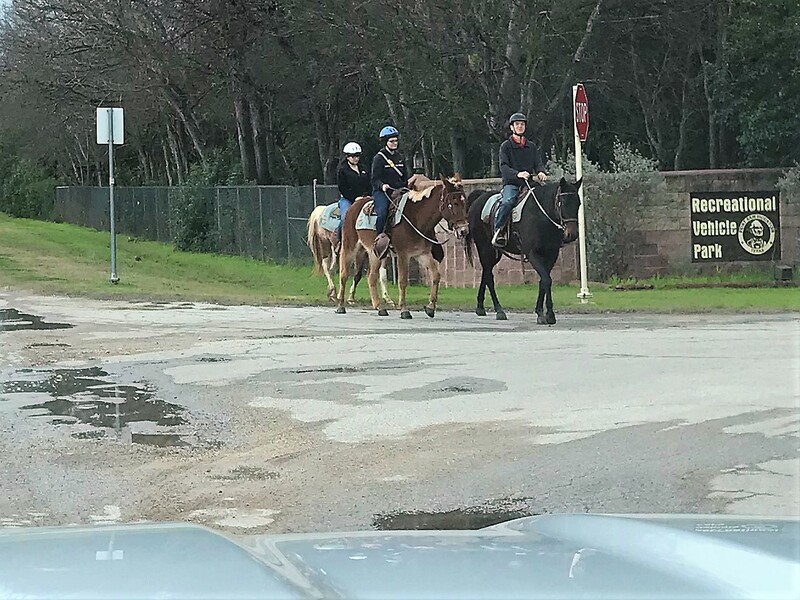 Folks in Texas are very friendly to tourists and us snowbirds, which they refer to as Winter Texans. 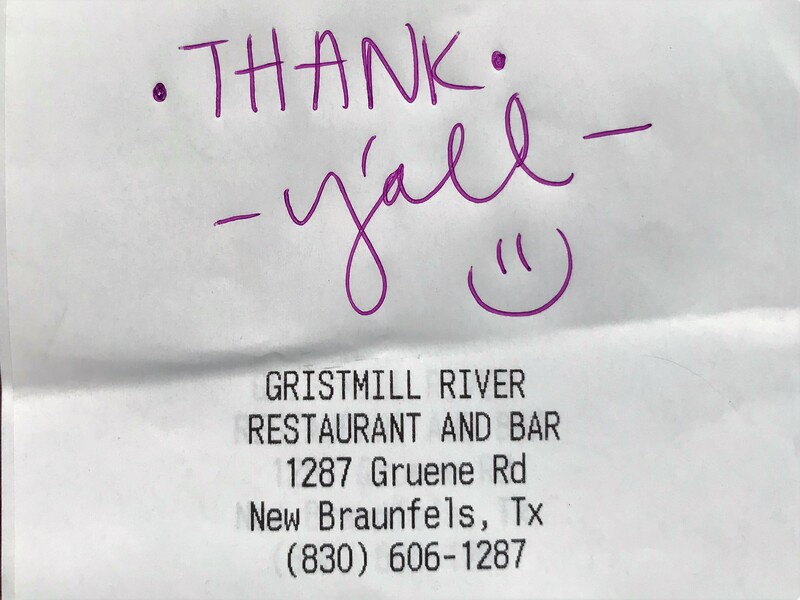 Keeping with that tradition, our very pleasant waitress left this homey greeting on our guest check. 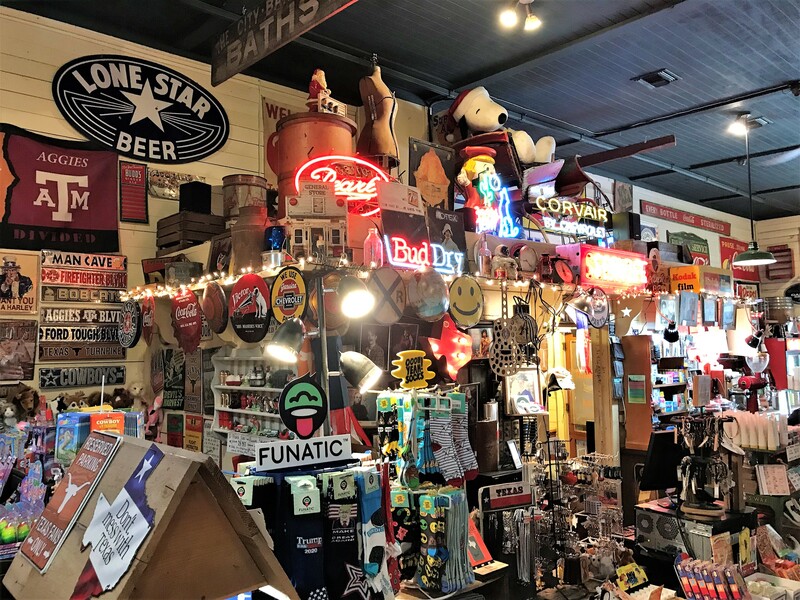 As we waddled out of The Gristmill and into the many antique and gift shops housed in the historic downtown, we were glad that an enterprising college student had the forethought to champion the preservation of the Gruene town center. In the shops, amongst other items, Kit and I picked out these two souvenirs. Yep, they just about cover the major food groups and will not likely last the week. Wandering around one of the shops, I was impressed by the recycling of an everyday object to patch holes in the old wooden floor. 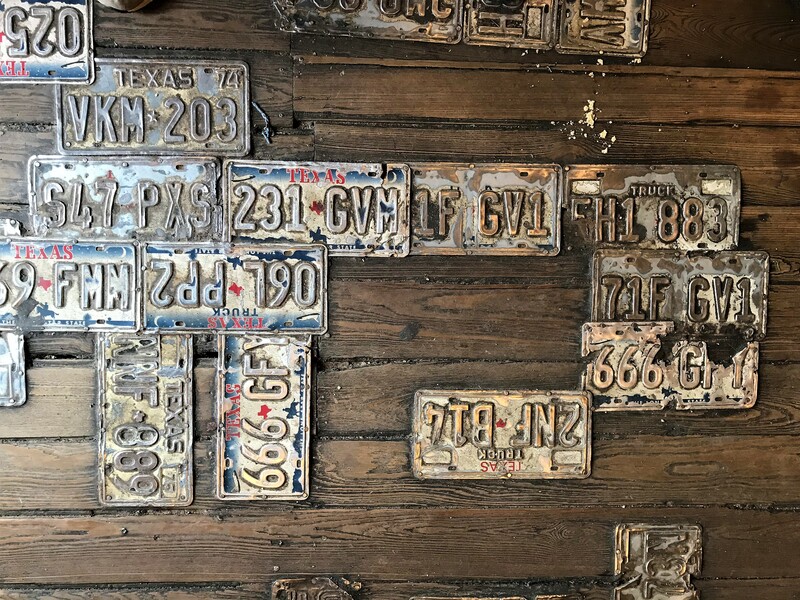 I have amassed almost 55 years of used license plates, might have to use them as a decorative element in our home! 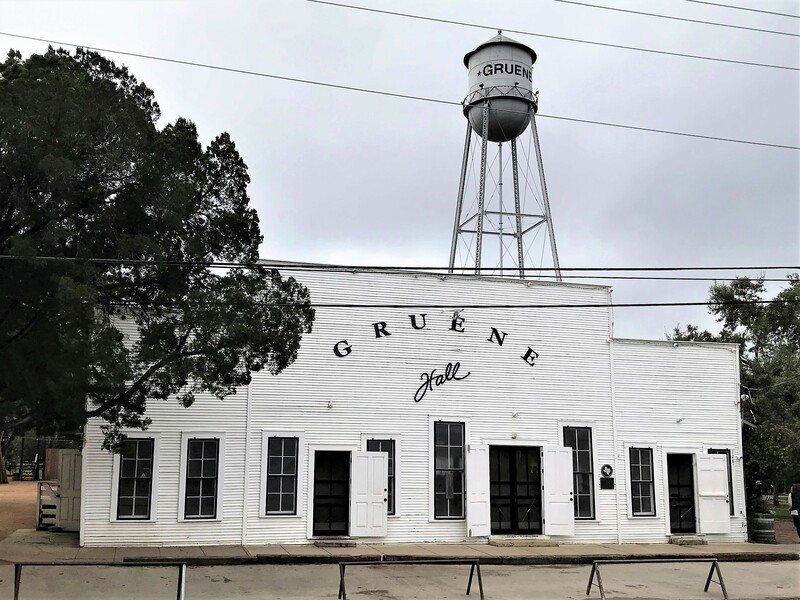 Also located within the town is the famous Gruene Hall. 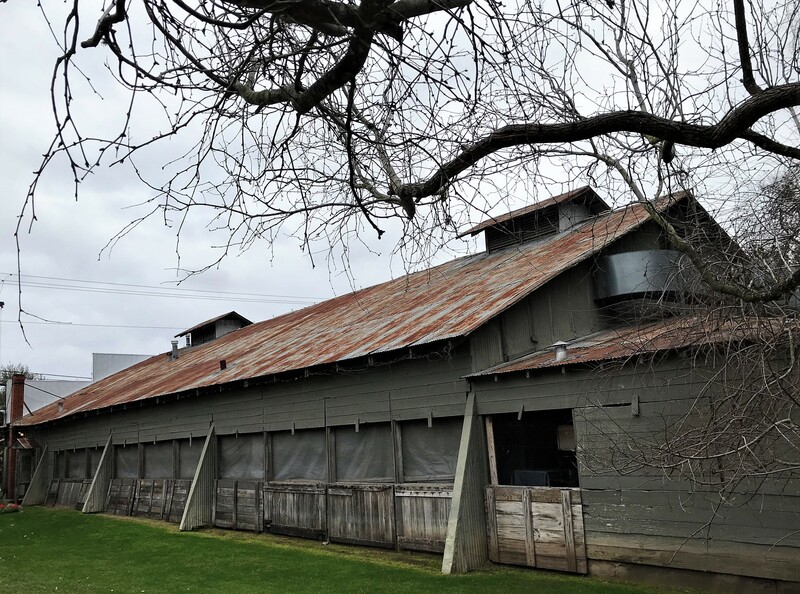 Built is 1878, it is billed as the oldest continuously active dance hall in the state hosting many well-known country performers throughout the years. 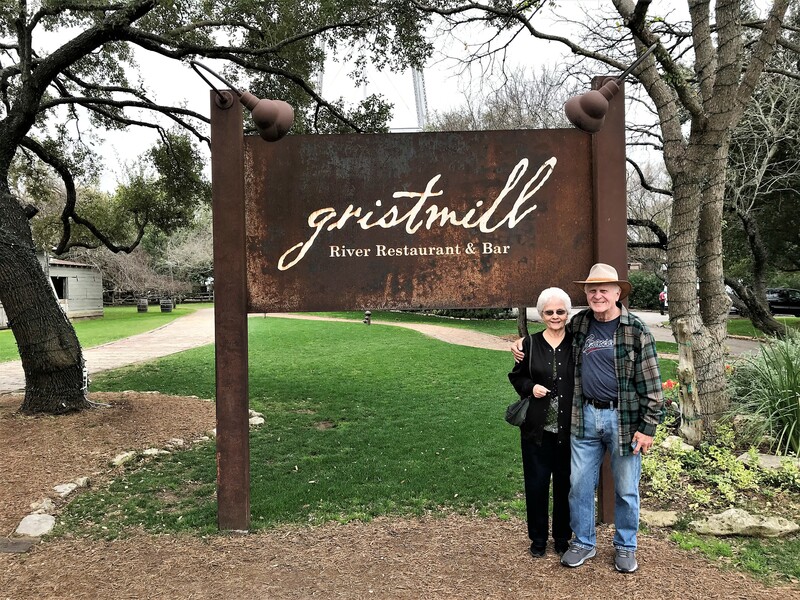 Kit and I had enjoyed an evening at Gruene Hall during a previous Excellent Adventure trip, so we all decided to not wait for the hall to open for the evening and instead make our way back to the campground. 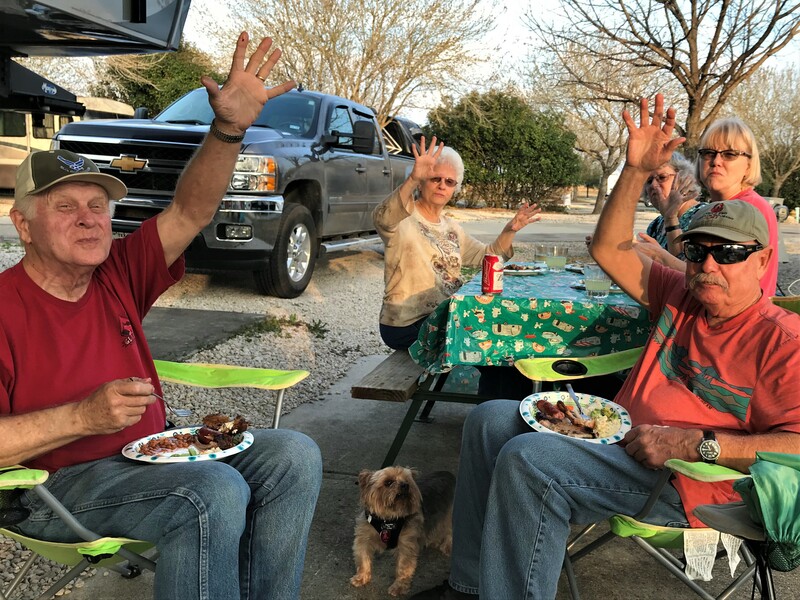 We spent some of our time in San Marcos attending to domestic chores and just hanging around camp with Rey and Darlene. 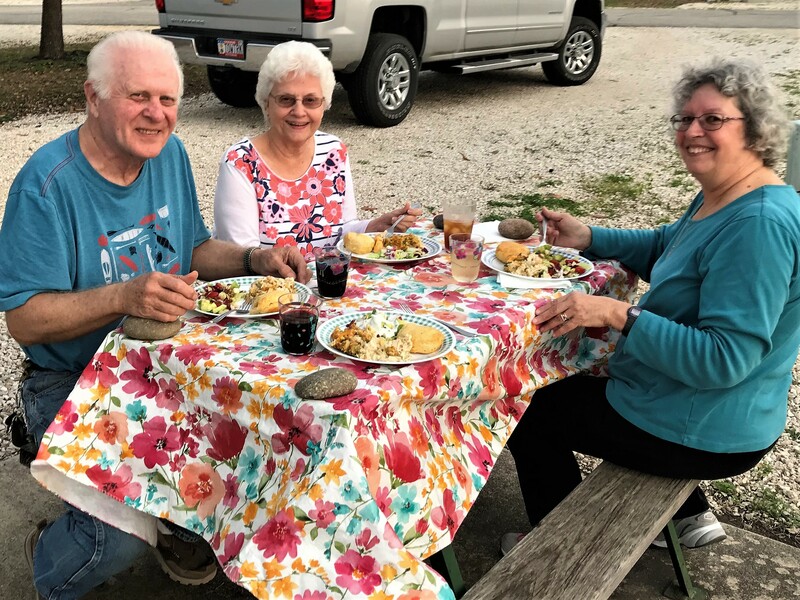 On one occasion, we hosted a picnic meal at our site. 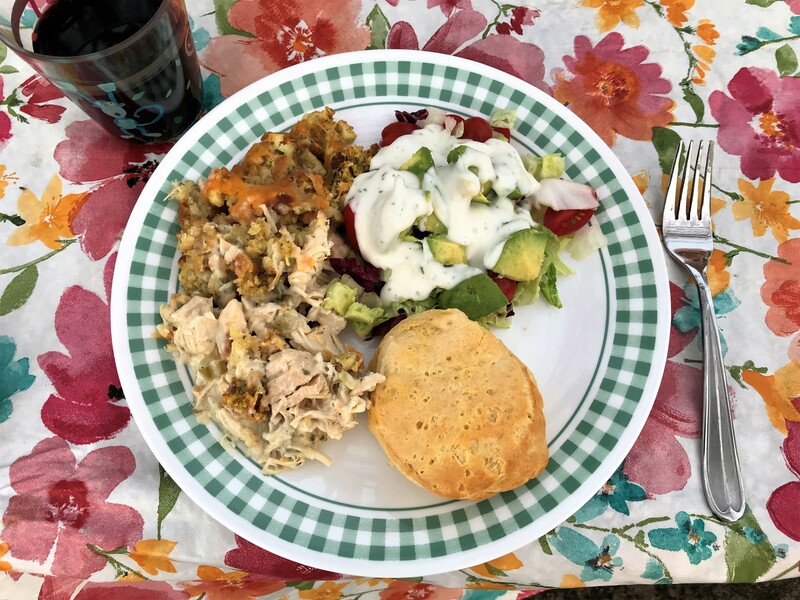 Which featured salad and Kit’s signature chicken with dressing dish accompanied by freshly baked ricochet biscuits. The meal paired very well with Gallo Red, vintage yesterday. During our stay, the four of us piled into Rey and Darlene’s truck and headed west toward Johnson City. 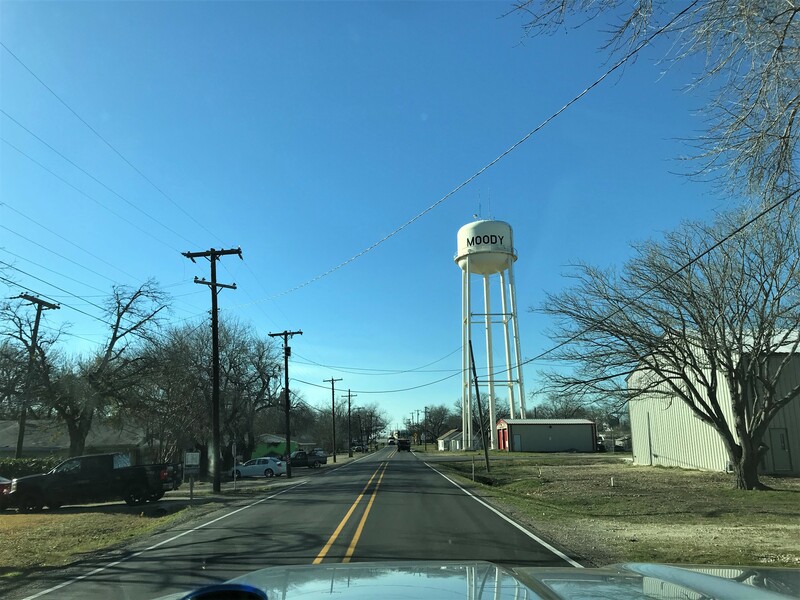 Founded in 1879 by President Lyndon Baines Johnson’s uncle, James Polk Johnson, this small village was the ancesteral hometown of our 36th president. 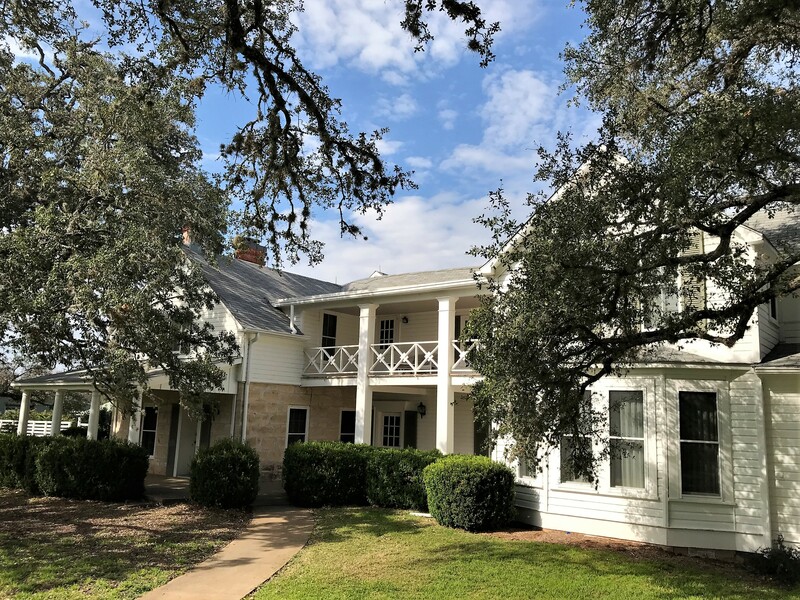 Our first stop was at the nearby Lyndon B. Johnson State Park and Historic Site, which features the visitor’s center for the Johnson Ranch located across the Pedernales River and is the home of the Sauer Beckmann Living History Farm. 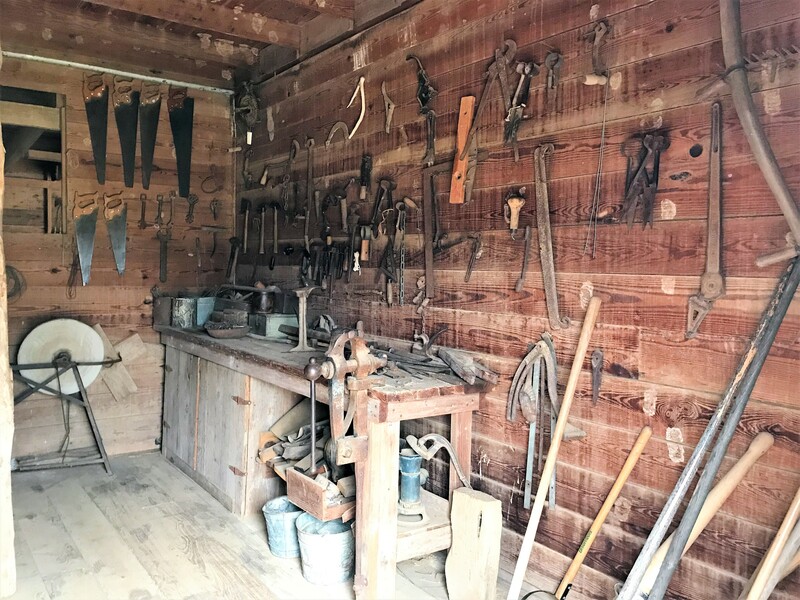 …is staffed by volunteers in period clothing who work the land, care for the animals, and maintain the property using period tools and technics. The communal kitchen cooks lunch for the staff using only crops and animals raised at the farm. …such as these sausage links. 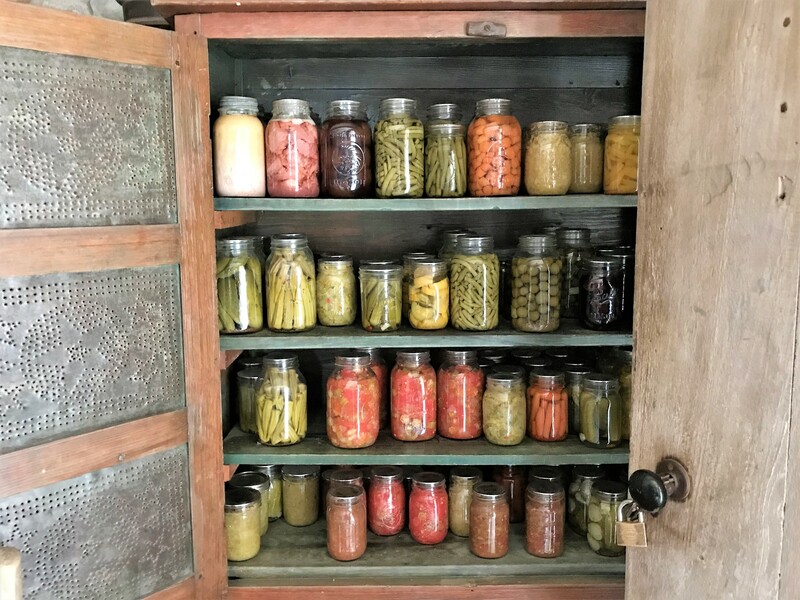 …to be gravity fed to the kitchen and barn when needed. 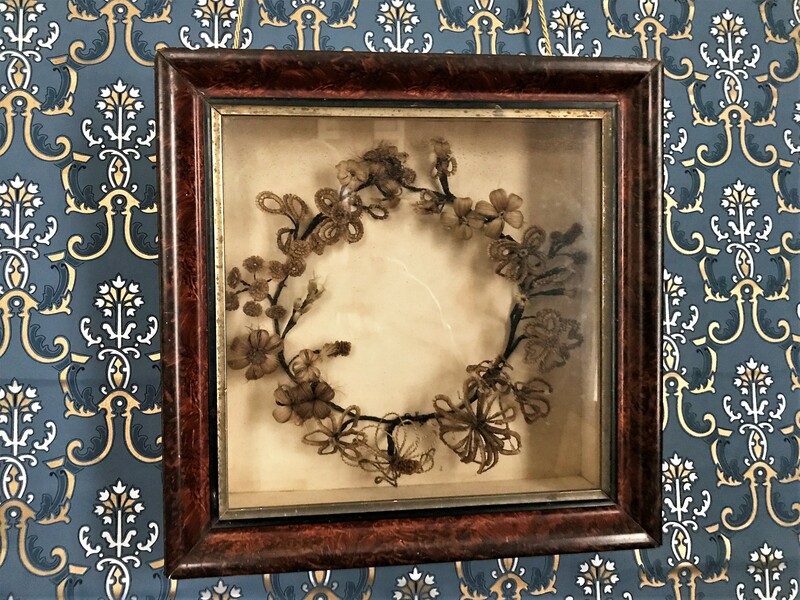 A curious artifact inside the residence is this human hair wreath. These intricate works of art were common to the era as memorials to departed loved ones made from the hair of the deceased. 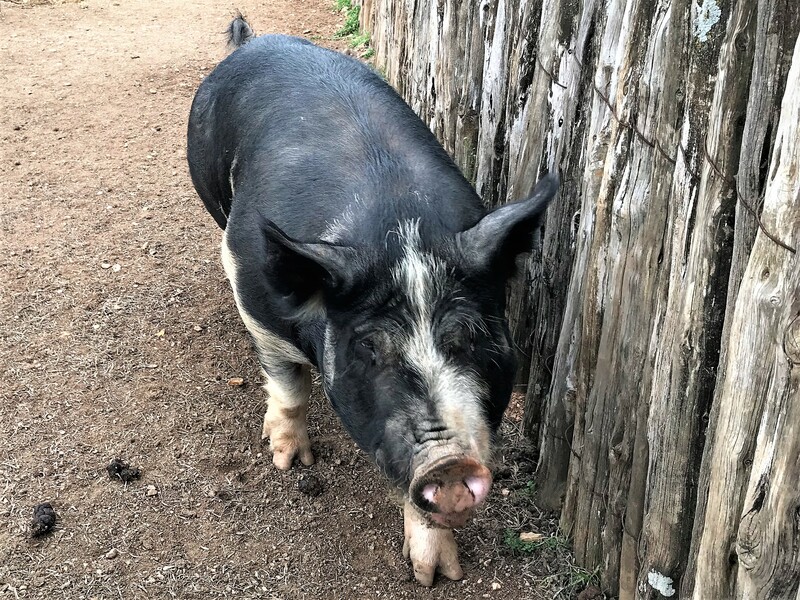 Of the many animals on the farm, this little guy seemed to be very friendly and inquisitive…and took a liking to us. …in a day or two he’s slated to be a pile of bacon. 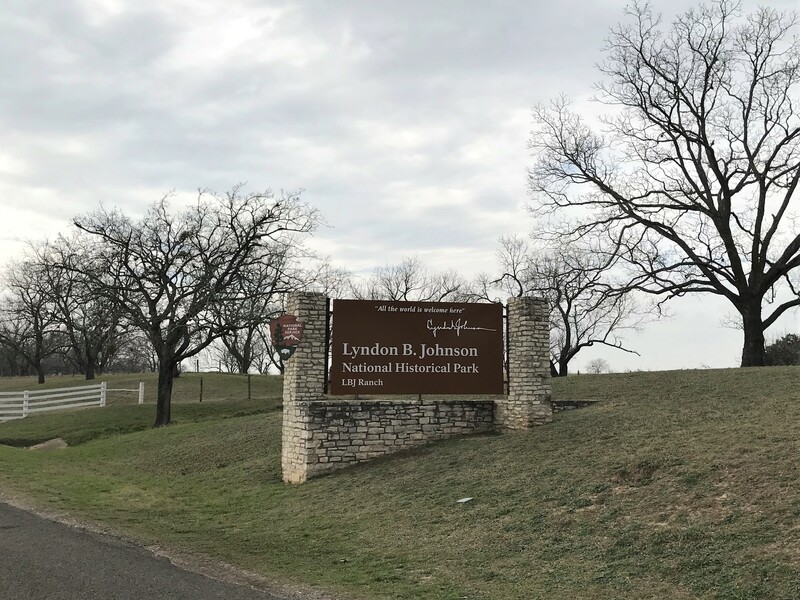 On the opposite side of the Pedernales River from the Sauer Beckmann farm is the Lyndon B. Johnson National Historic Park. 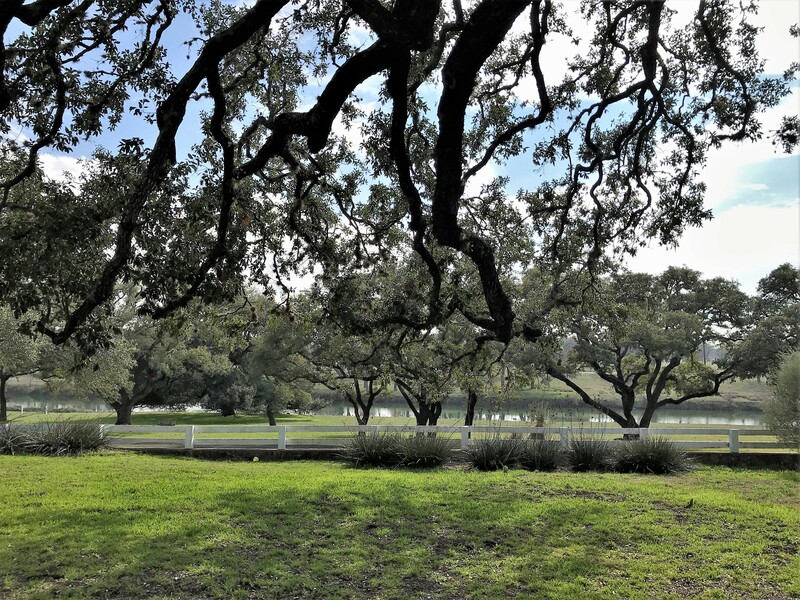 Known during LBJ’s presidency as the Texas White House, this ranch was a place of relaxation and rejuvenation for our Vietnam era president. …many important American and international leaders would gather and discuss ways to solve world problems and improve the planet and its people. Assuming the presidency following the tragic assassination of John Kennedy, LBJ went on to serve as our chief executive for an additional six years. 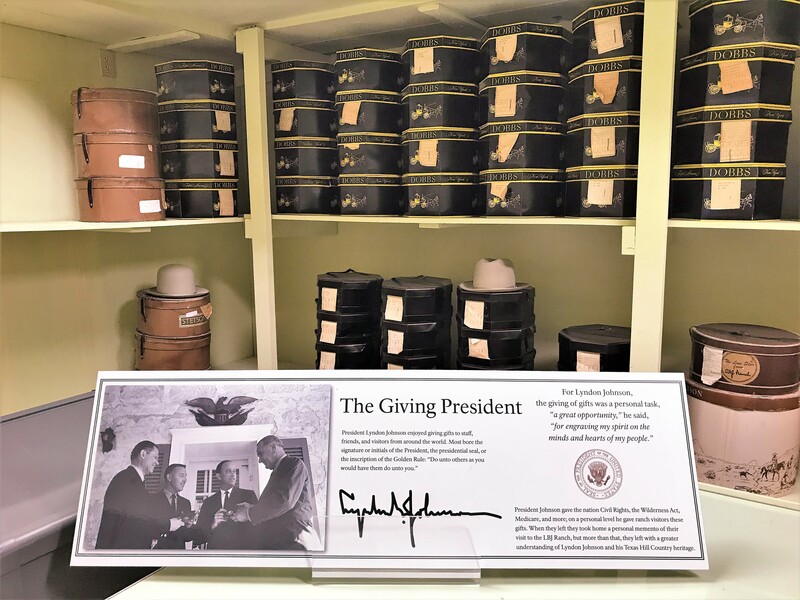 Among his signature accomplishments were the 1964 Civil Rights Act and the 1965 Voting Rights Act, the formation of the National Endowment for the Arts, establishment of Medicare and Medicaid Programs, and many other examples of progressive legislation. He also oversaw the largest growth of GDP of any president in modern times. Unfortunately, the protracted war in Southeast Asia and decisions made by our country’s leadership tarnished his accomplishments. …which would land on his 6,000-foot asphalt runway a mere one hundred yards from his home. 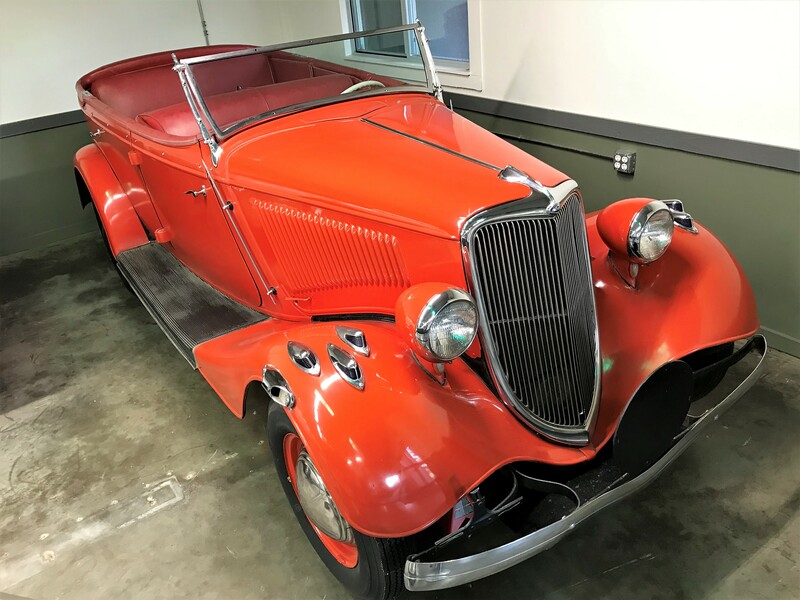 …which LBJ called the Bullets and Booze car. 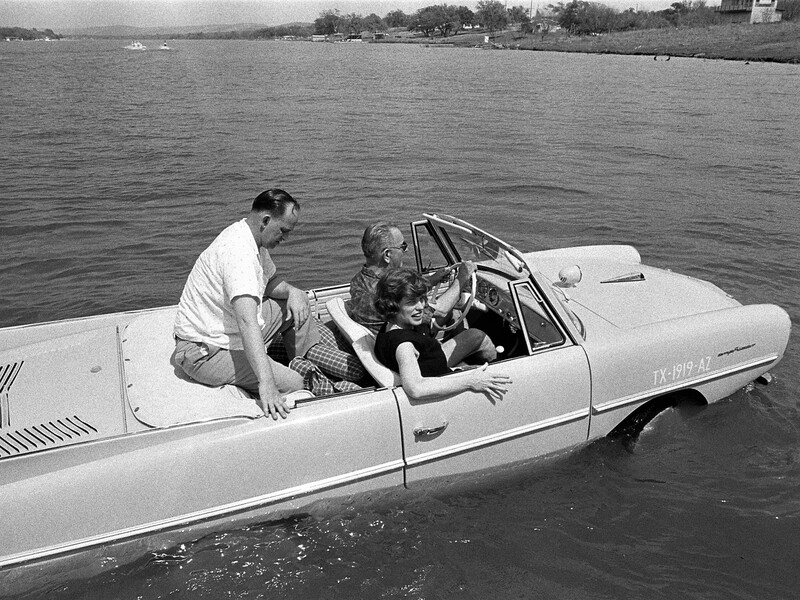 Below is a photo of the president driving the car across the Pedernales River by way of the Johnson Dam. 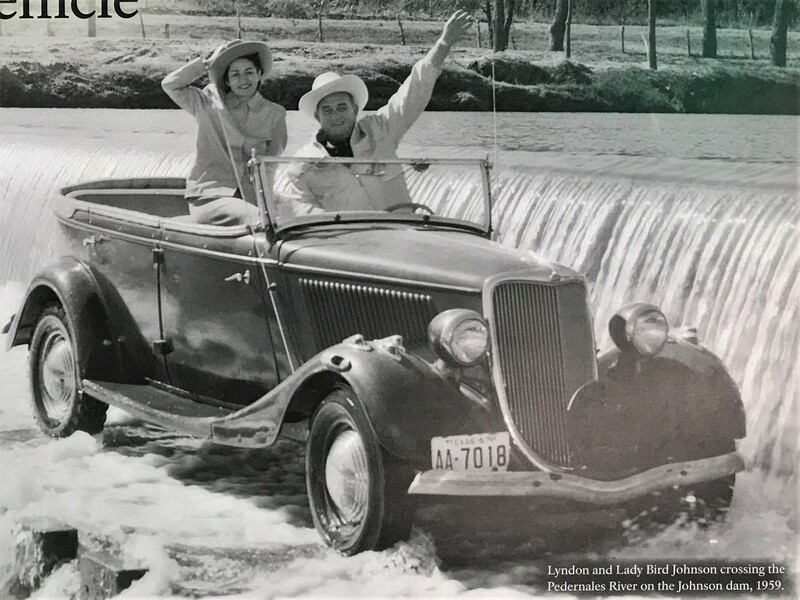 A consummate prankster, LBJ would delight driving unsuspecting guests about the ranch and abruptly head for the river and drop down to the roadway at the base of the dam. This Caused the tires to send river water spraying in all directions and the passengers to shriek in terror. 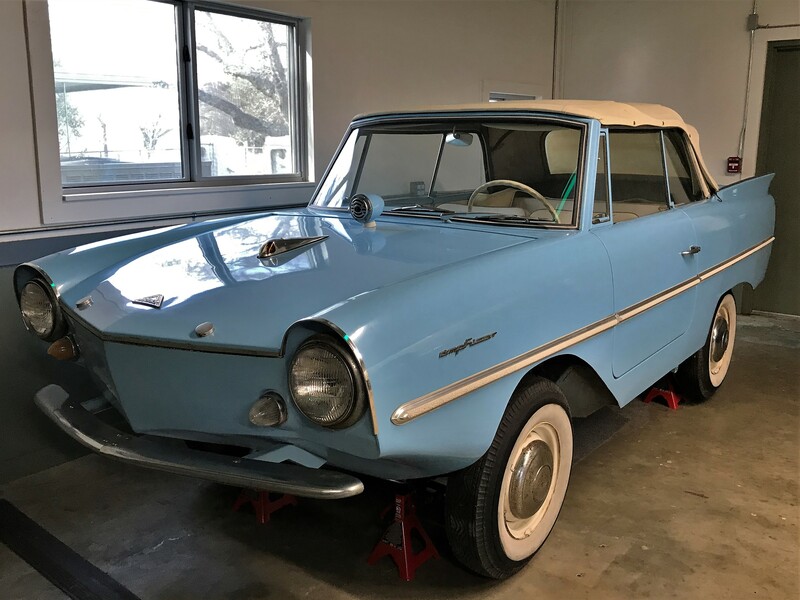 Another of his favorite vehicles, and one he would also use to prank guests, was his 1965 Amphicar. … laughing uproariously about how he pranked the new guy. …such as the dorky dude shown above. …however, unlike more recent politicians, he failed to melt down into a heap of pompous self-importance. 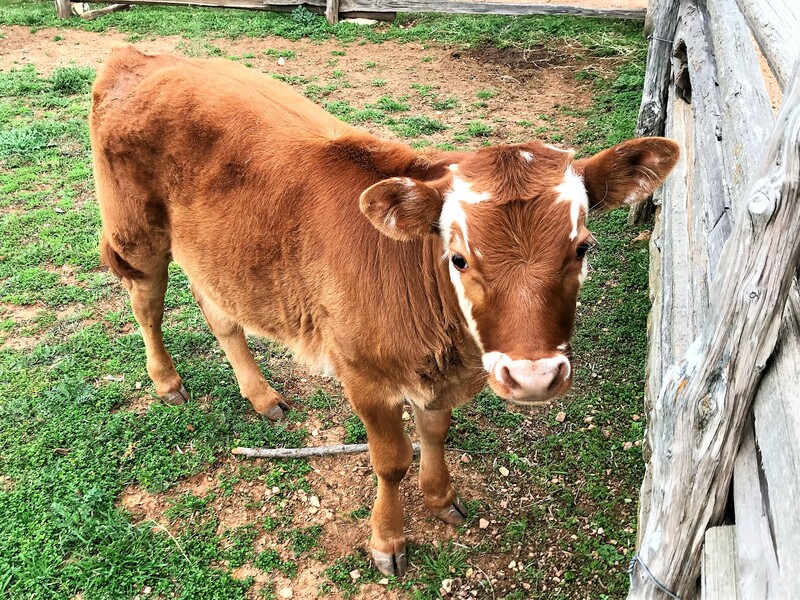 The LBJ ranch is still in operation, now managed by the National Park Service, and is continuing the lineage lines in the cattle they raise and maintain. 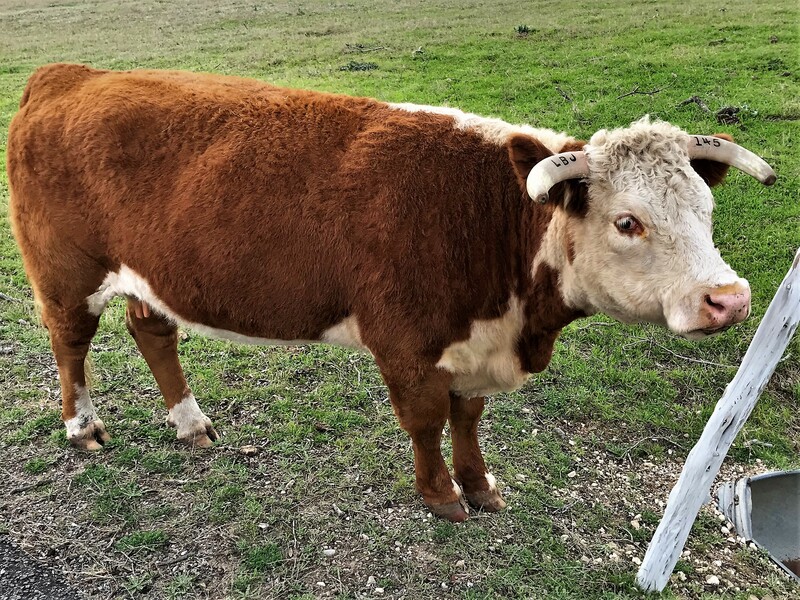 When mature, the cattle are auctioned off fetching many times their market value due to their bloodlines and connection to history. 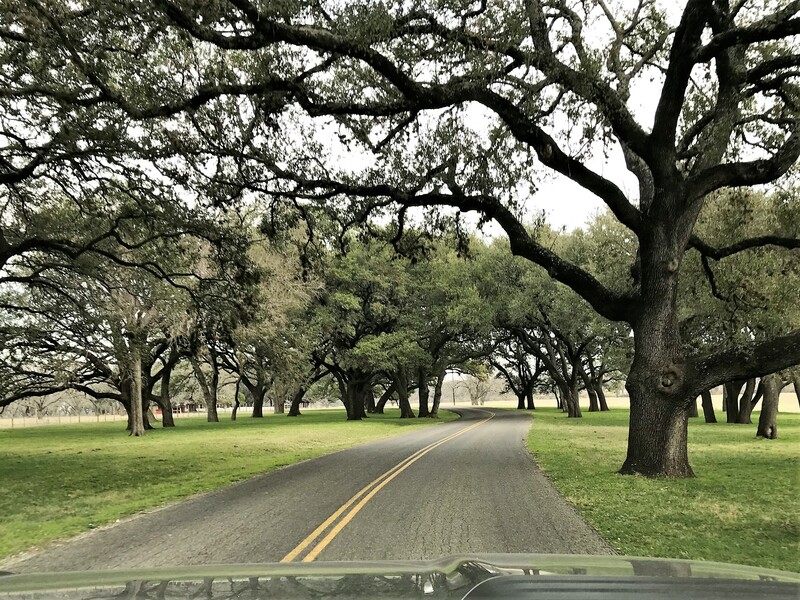 A driving trip around this massive ranch is very pleasant and one can sense why LBJ found solace and rejuvenation in this beautiful place. 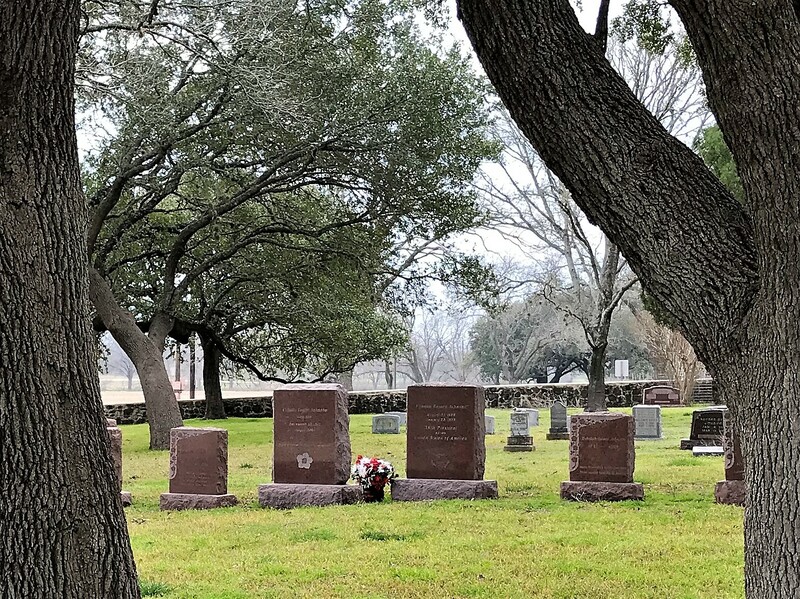 The Johnson family cemetery, located at the ranch, contains the remains of LBJ and Lady Bird, as well as other family members. 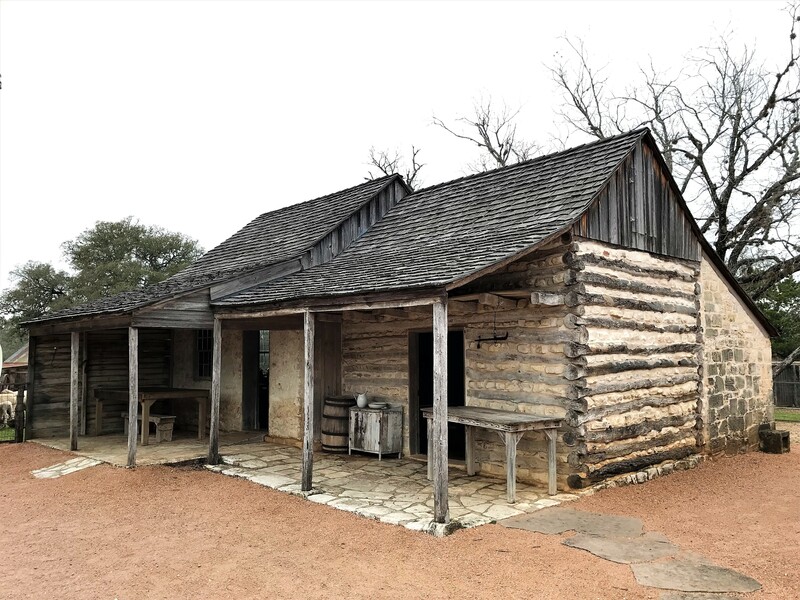 What a great day exploring the home and ranch of a great Texan who had a significant impact on the welfare of the citizens of our great nation. 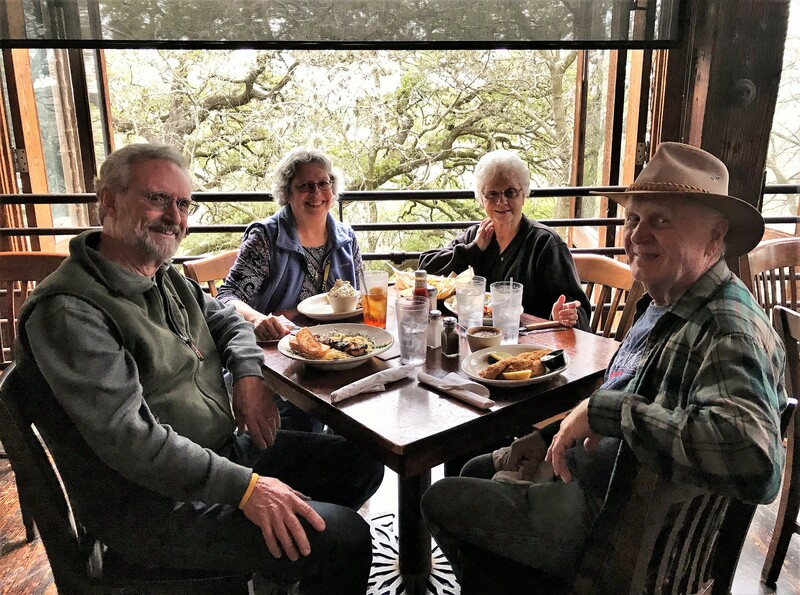 Kit, Darlene, Rey and I were so busy touring the LBJ Ranch we missed lunch, so an early dinner was in order. 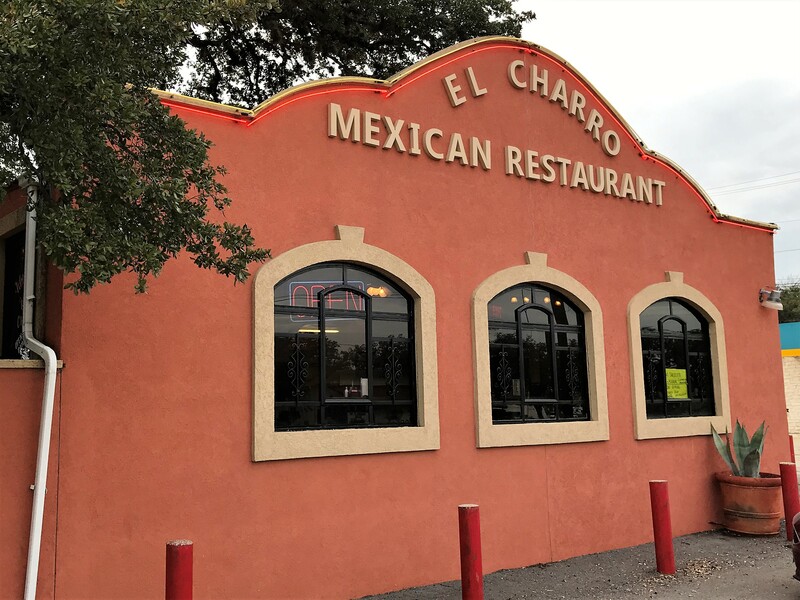 Finding a highly rated restaurant via Google, we made our way top El Charro. The food was authentic TexMex and very good! 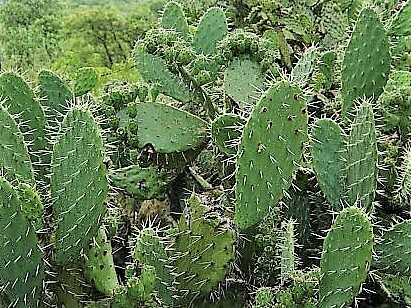 The greens smothering my Carne Asada dish were Nopales …below is a photo of Nopales in its raw form. 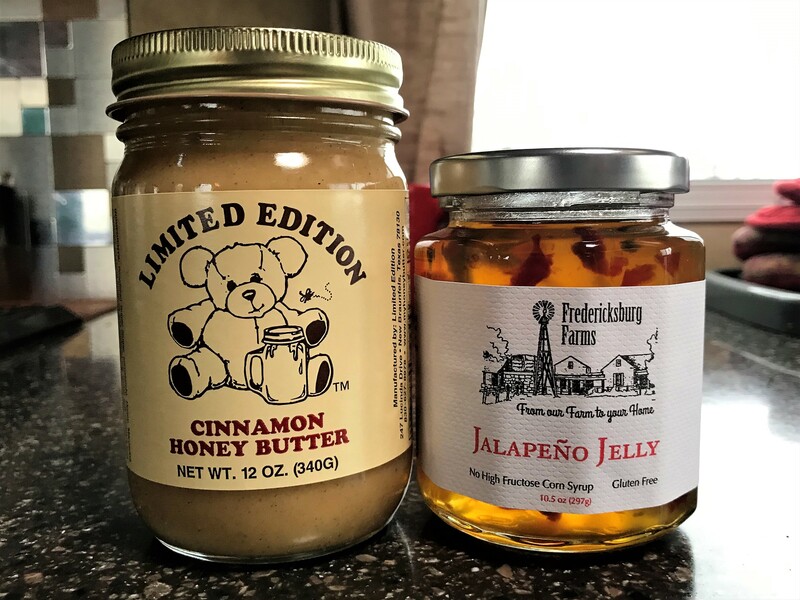 A bit unique to our New England palate, but very flavorful! Kit’s sister and brother in law used to live in this part of Texas before migrating back west to San Diego. However, parents Don and Paulene still live in the area and met us at a local restaurant one evening. 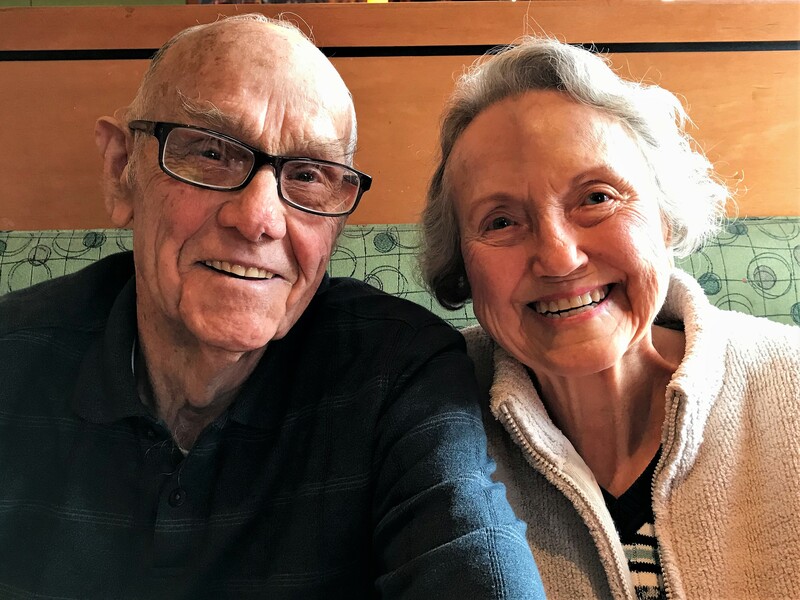 A delightful couple approaching the ripe young age of ninety, Don and Paulene are very active, dancing and socializing many nights a week. Thanks. 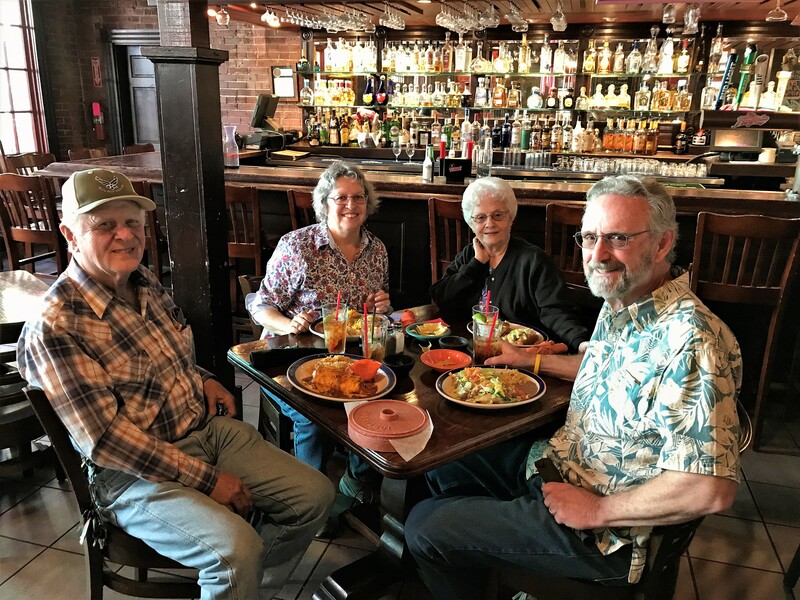 Folks for treating us to a nice meal…take care and hope to see you again soon. 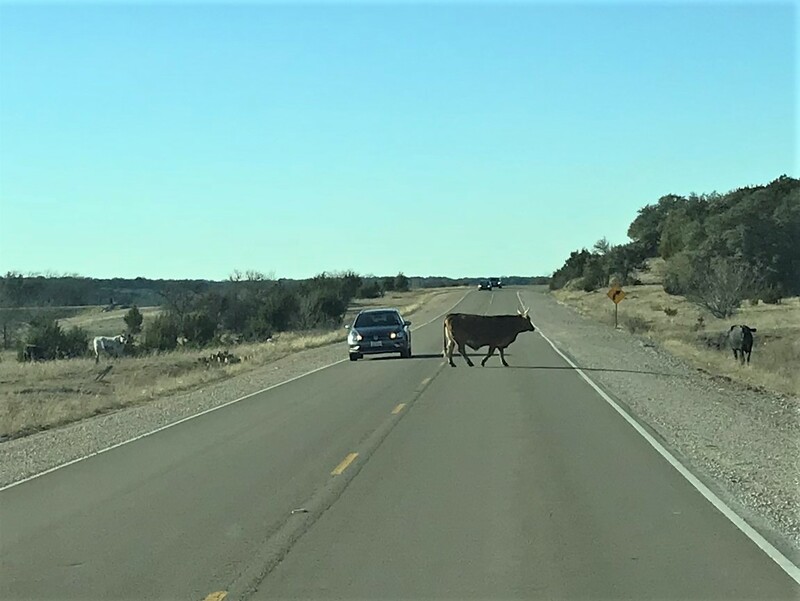 Well, that brings our stay in this part of Texas to a close. 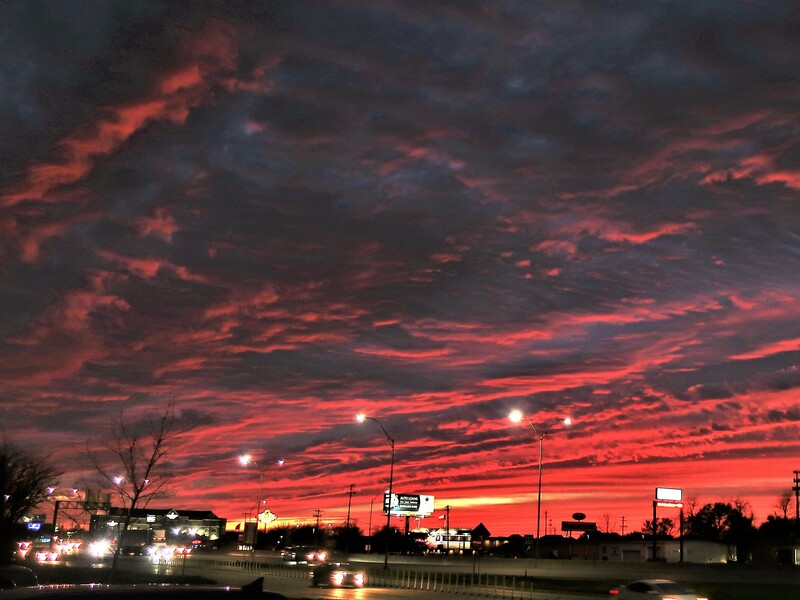 As Kit and I emerged from the restaurant, the South Texas Sky bid us farewell. Stay tuned as we reverse direction and start heading easterly. Kit’s Bit’s: Many thanks to Ray & Darlene for showing us so many interesting things in their area. As with many of the places we stay, due to time constraints, we miss a lot of the interesting sights. As with many of our stops, we never get to see as much as we’d like to. Staying in one place for an entire week allowed us to explore some very interesting spots. Also, it was great to see Don & Pauline again, we haven’t seen them in many years. 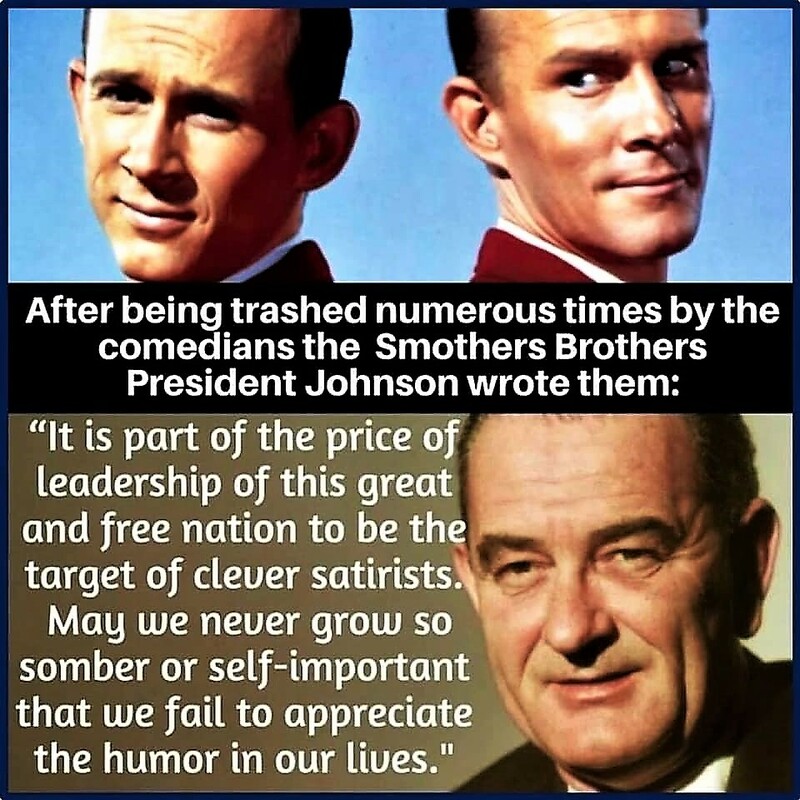 They are still as vibrant and active as they were 50 years ago! Keep on dancing! 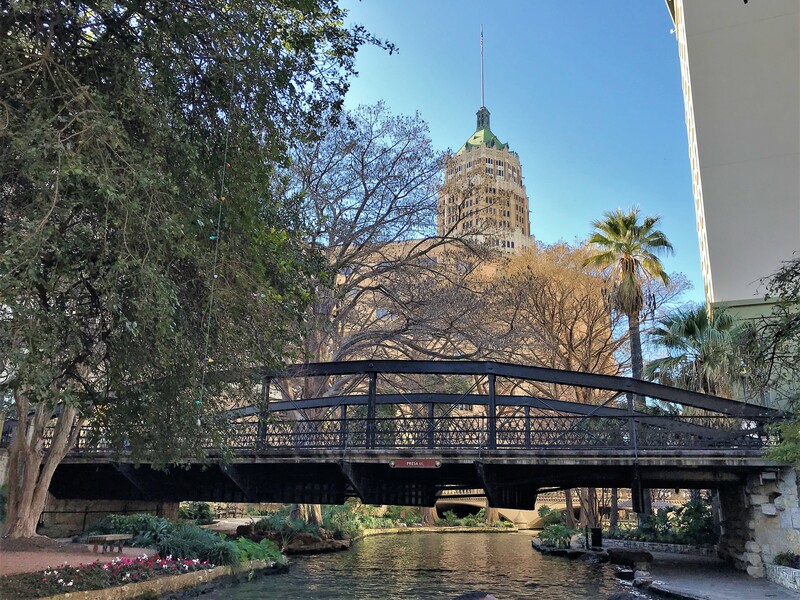 Sunday, January 27 through Wednesday, January 30, 2019 San Antonio, Texas: Kit and I are excited about finally getting to more thoroughly explore this iconic South Texas city. 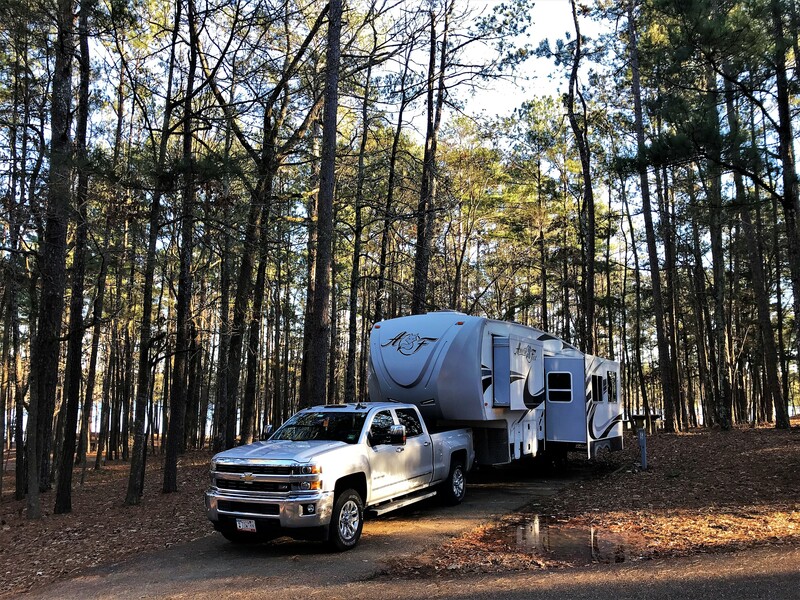 The last time we spent any appreciable time here was in 1976 when hauling our 1967 fifteen-foot Excel travel trailer with our three children on a cross country camping adventure. 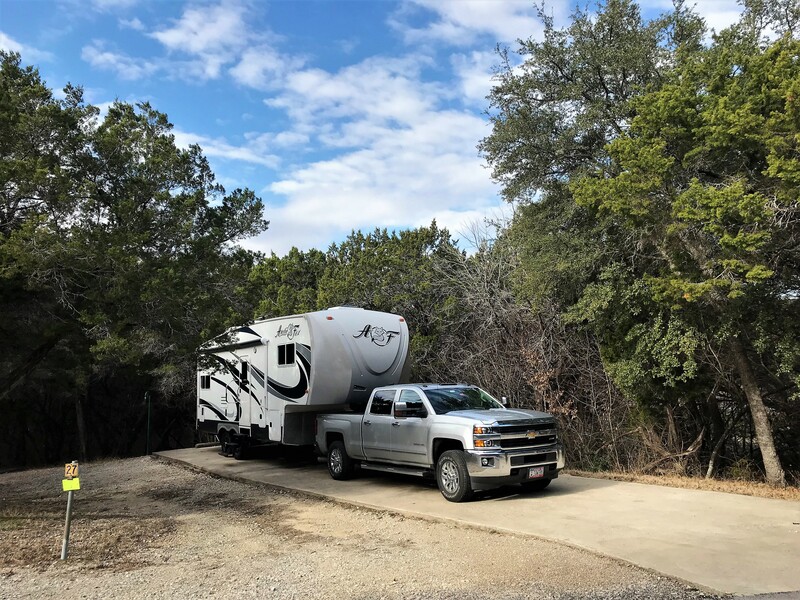 That was fun, and a real family bonding adventure…five humans in a small trailer with an ice box, no bathroom, and gas lamps for interior lighting. This stop finds us living in relative luxury! Spent four full days here and was able to see quite a lot of the main attractions of this beautiful city. 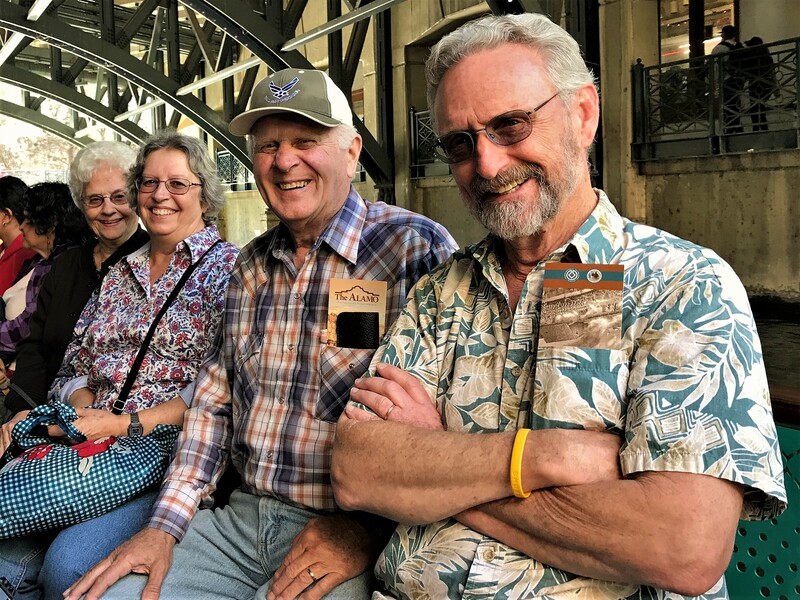 We were also fortunate to have some dear RV’ing friends, who spend the winter in a park about 50 miles to the north, come down and join us for some of our excursions. 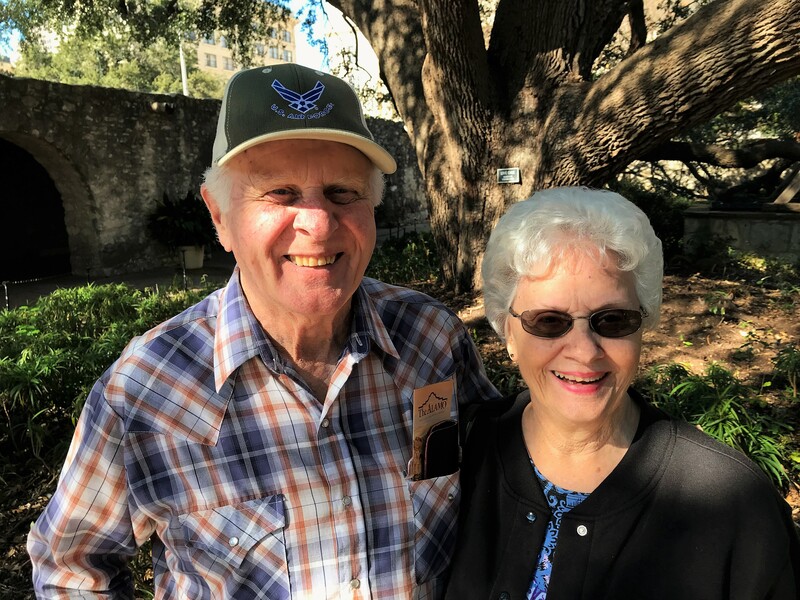 Rey and Darlene have Texas roots even though Rey was born and raised in Topsham, Maine. They know this area very well having spent many years living and working here. 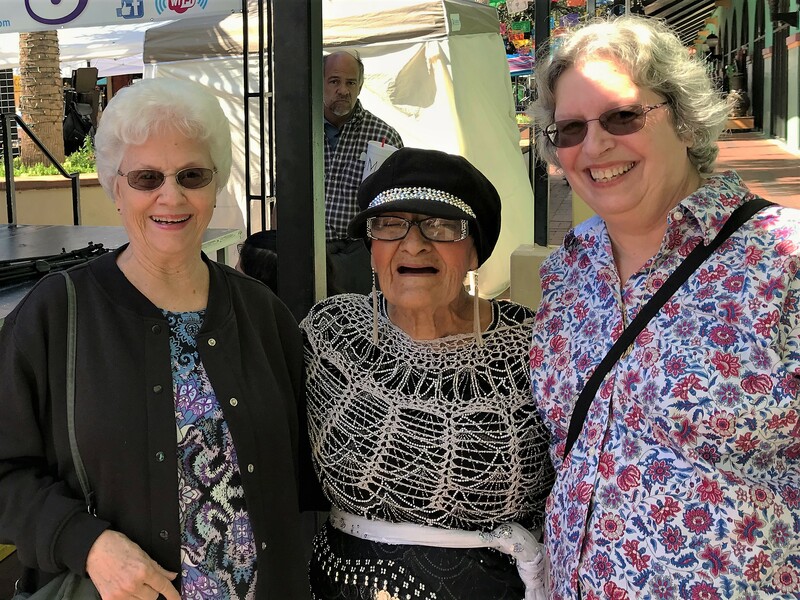 One place they led us to is the historic Mexican Marketplace which was full of colorful shops selling authentic Mexican crafts. 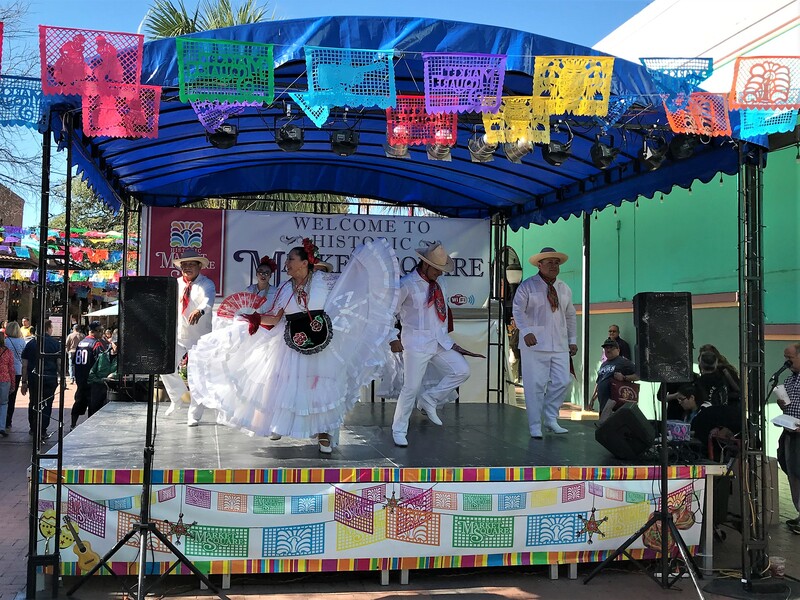 Since we visited on a Sunday, the place was hopping, and the plaza performance stage featured live acts such as this Mexican Folkdance troupe. The matriarch of the family-based group was this delightful Senora. 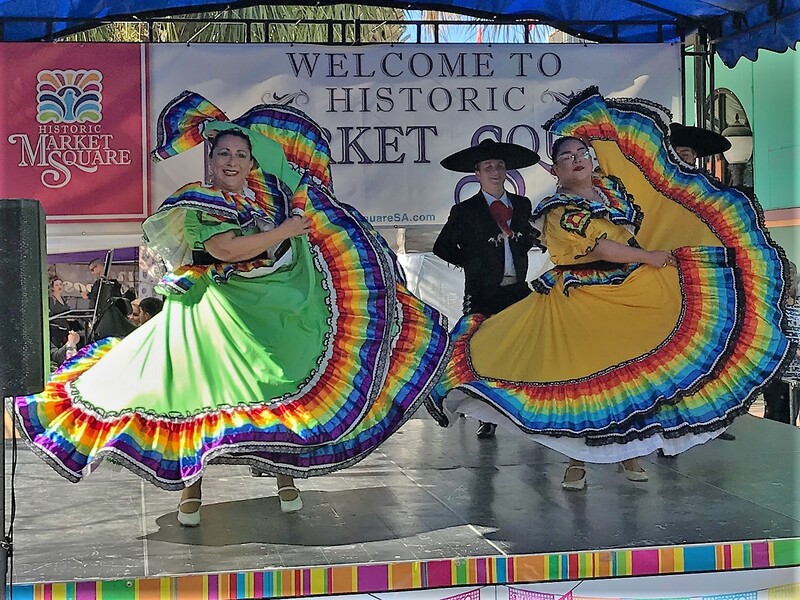 Margaret Arriaga is an eighty-two-year-old cancer survivor and obviously lives life to the fullest…she was actively involved in the groups dancing and proved to be the delight of the hundreds of happy onlookers that enjoyed the performance. At one point the performers came into the audience and selected folks to dance with. 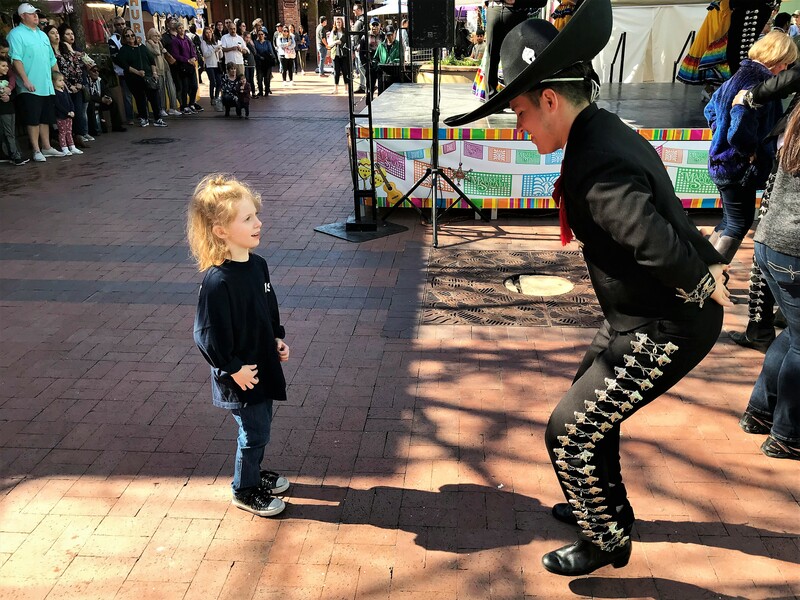 This cute young dancer was a fast learner and quickly kept step with the professional. 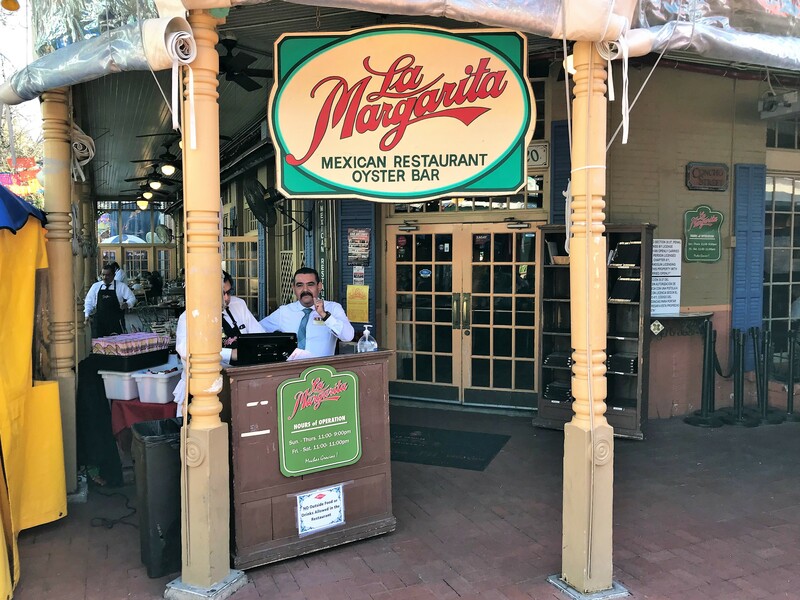 Being San Antonio, there is no shortage of fine restaurants that specialize in authentic TexMex…one that Rey and Darlene’s favorites is La Margarita. 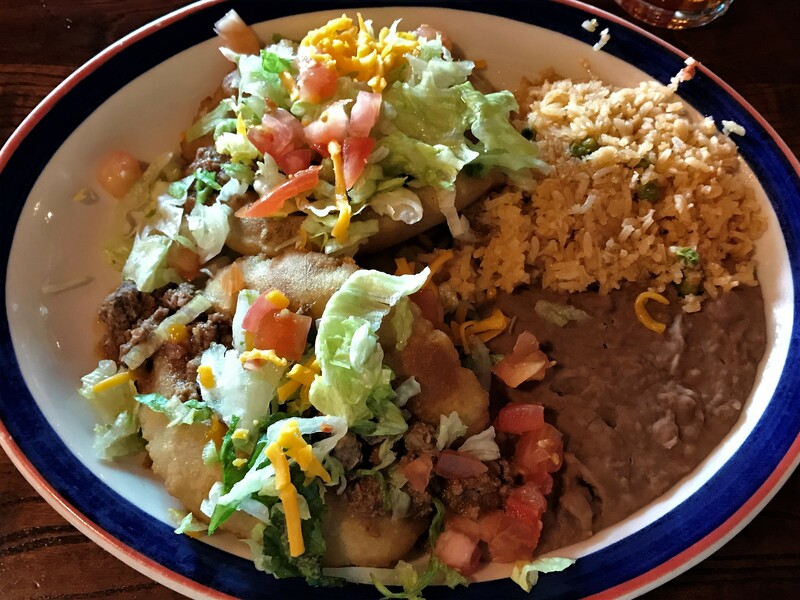 …while being serenaded with mariachi music and enjoying authentic dishes such as these Puffy Tacos. 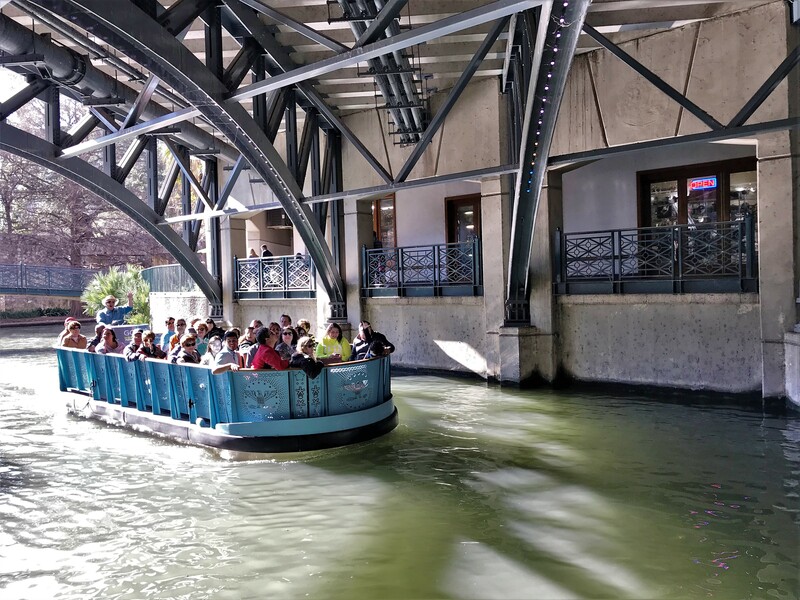 After lunch, a walk down San Antonio’s Riverwalk was in order. 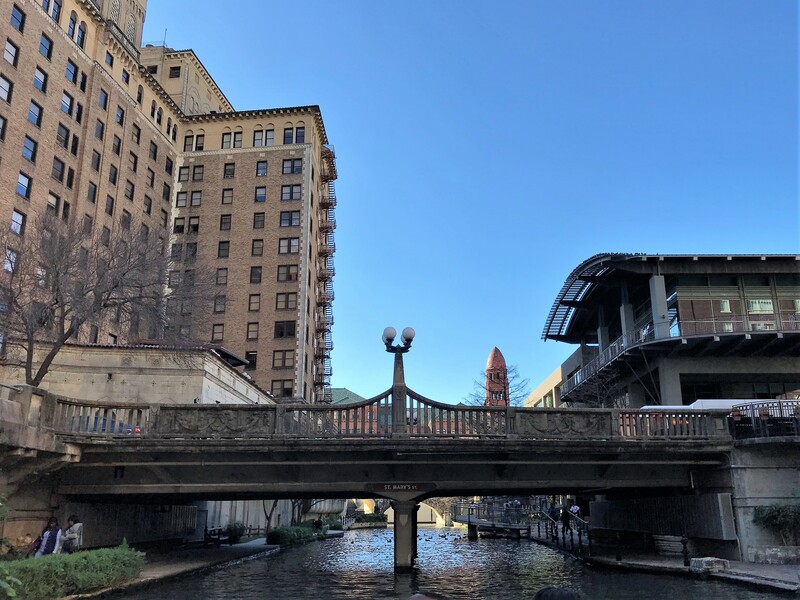 This major downtown arts, shopping and dining area was created along the San Antonio River in the mid 1930’s by the Works Project Administration. Due to seasonal flooding of the area, dams and gates were built to prevent river water from flooding the increasing number of riverside business and to protect the basements of the burgeoning cities commercial high-rise buildings. This created a stable canal and a pleasant artery to walk about the downtown area. A great way to see the 2.5 mile stretch of river is by boat. …as well as pedestrian walkways. 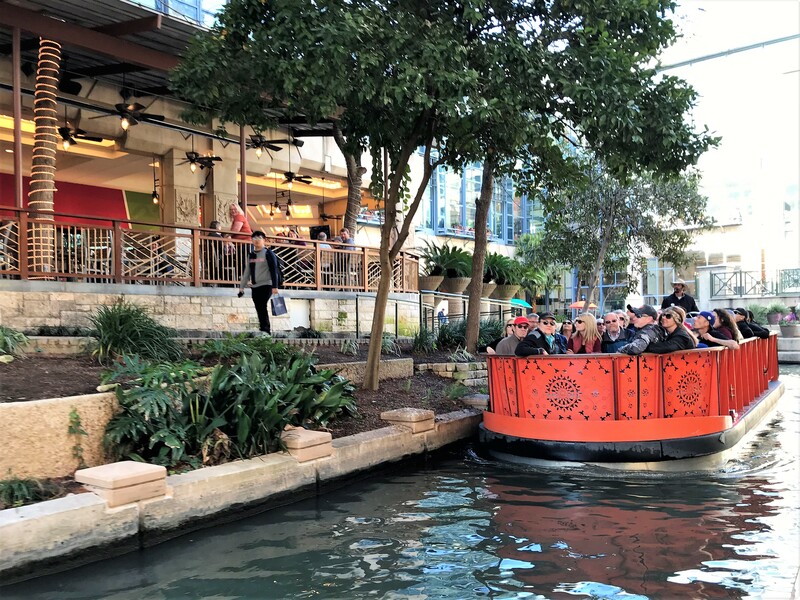 What a pleasant and relaxing way to see this part of the historic city! 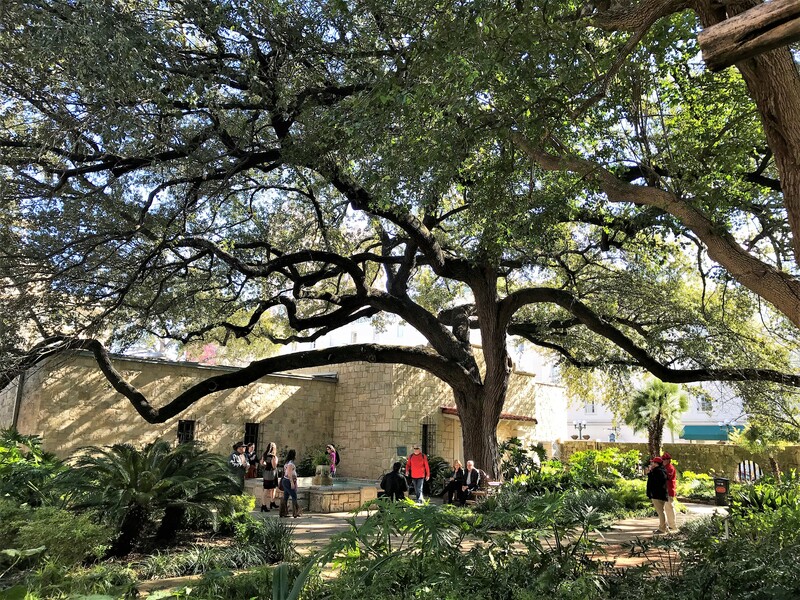 Speaking of history, the famed Alamo is located within the city limits of San Antonio. The Alamo was built in 1718 by Spanish Missionaries from Mexico for the Catholic Church. Their mission (no pun intended) was to convert the native population to Christianity and teach them modern ways of the Anglo world. Apparently, the way of life for the native Apaches and Comanches over their documented 10,000 years of existence, did not set well with the newly arrived Europeans. 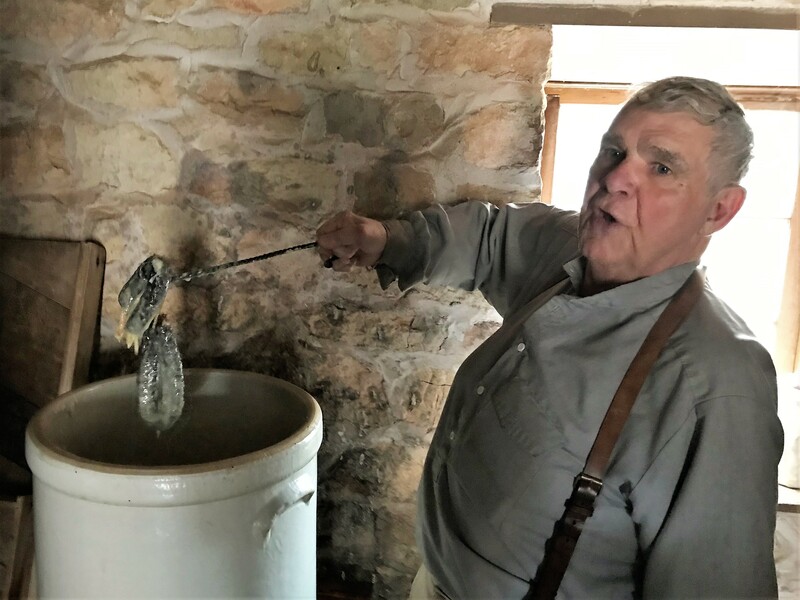 As hunters and gatherers, these native populations were perplexed by farming…why, they wondered, would one want to bury good food in the ground and keep it moist with scarce and good tasting water!?!? 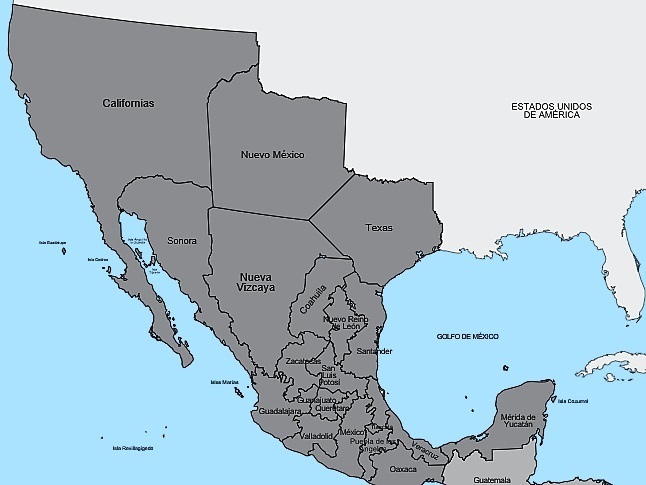 During this time, Texas…as well as a large part of the American Southwest, belonged to Mexico under Spanish rule. Wouldn’t our country be a lot different today had Mexico payed for a border wall during this period in history? Kit and I would have grown up in San Diego, Mexico! 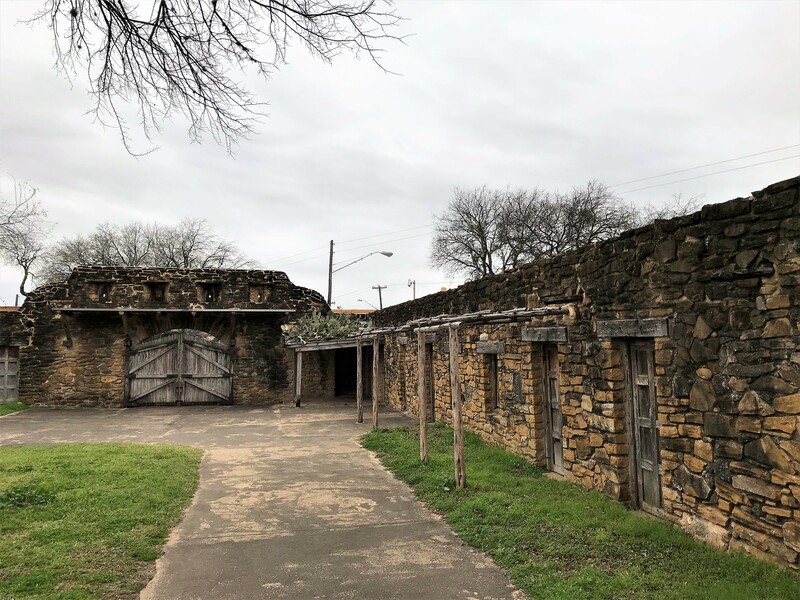 Abandoned by the missionaries seventy years later The Alamo was used for various purposes, including a rooming house, a garrison, and a grocery store. 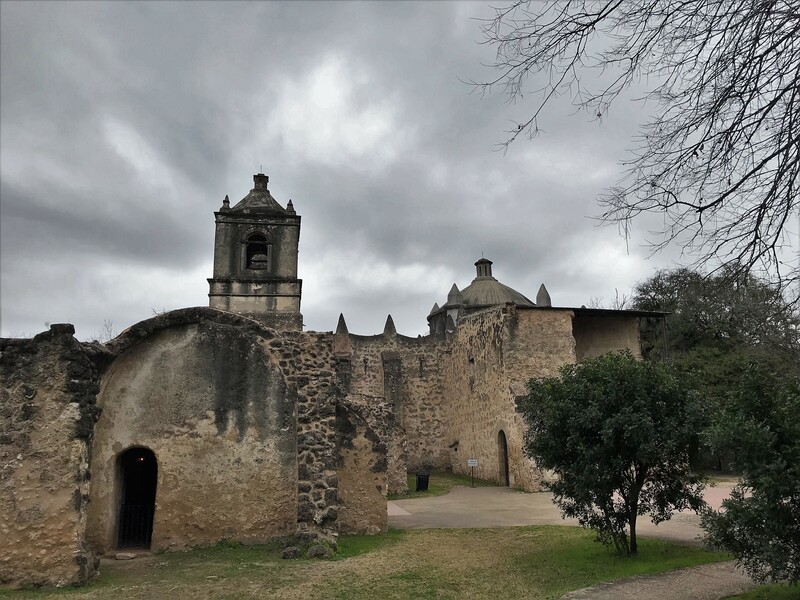 However, it’s thick stone walls and many fortified building’s, made it a prime fortress…first the Spanish, then the Mexicans, used The Alamo as a military outpost. 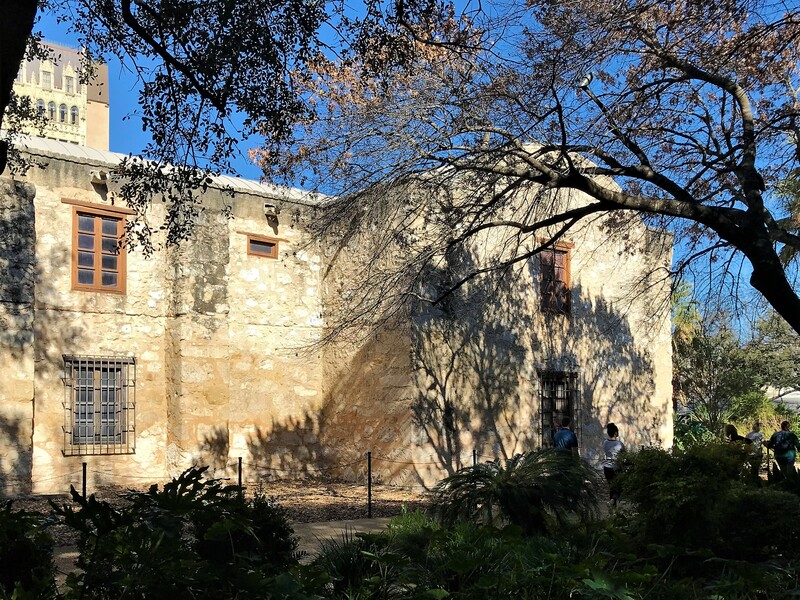 Following Mexico’s War of Independence with Spain, US citizens from the north moved into the area in increasing numbers and soon began their own War of Independence against the Mexican government seizing the Alamo, and control of the colonial village of San Antonio, from the small and ill prepared contingent of the Mexican Army. 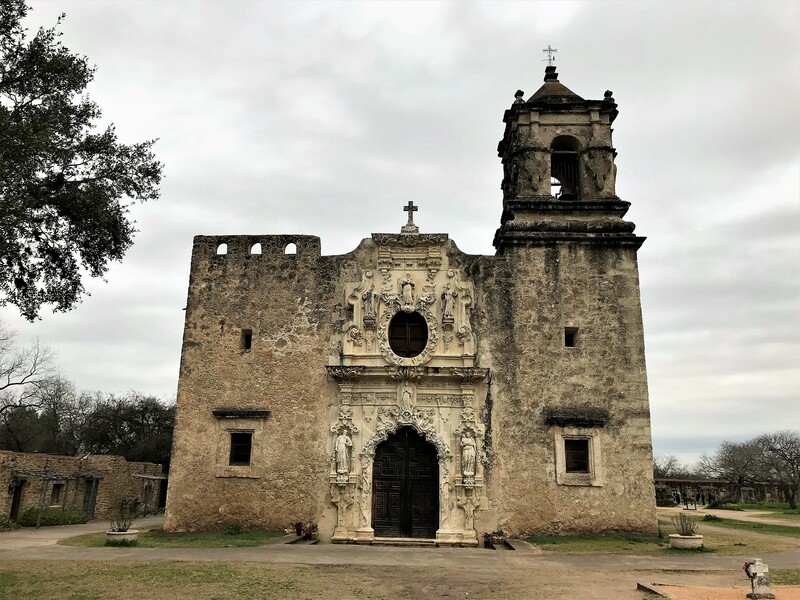 Their victory was short lived however, as within three months a reinforced company of the Mexican Army, numbering 6,000 soldiers, under command of General Santa Anna laid siege to The Alamo and attacked the defenders. 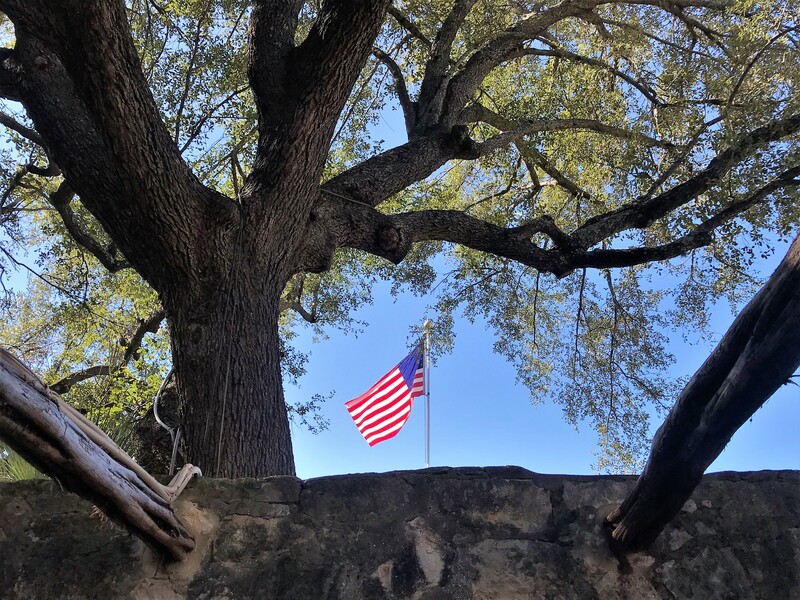 The Alamo patriots, numbering a mere 200-armed volunteers, held out for 13 days until they all fell under General Santa Anna’s “take no prisoners” command order. Amongst those lost in battle were Colonel James Bowie and frontiersman Davy Crockett. The latter was born on a mountain top in Tennessee, greenest state in the land of the free, raised in the woods so’s he knew every tree, killed him a bear when he was only three. OK…if you’re a child of the 1950’s you’ll spend the better part of the day getting rid of that earworm! 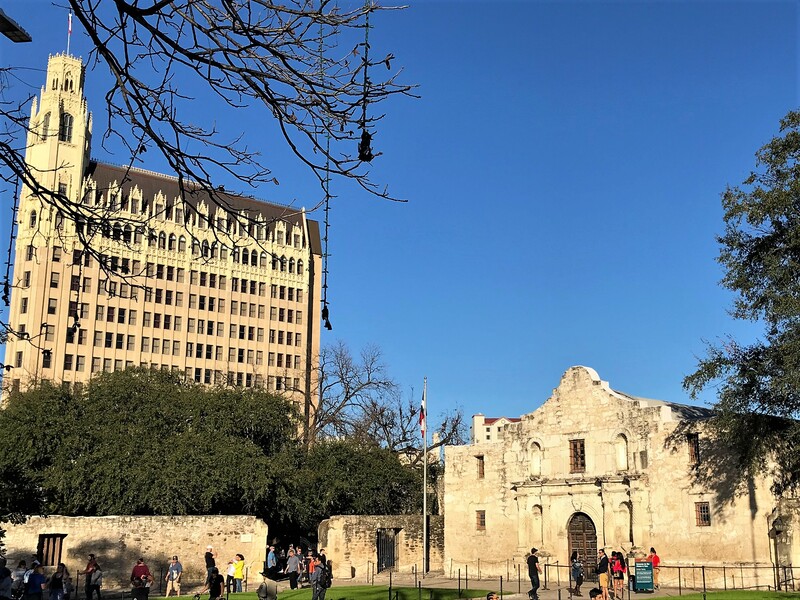 The Mexican Army only occupied The Alamo for a few months when 800 Texas loyalist shouting, “Remember the Alamo”, defeated Santa Anna’s force of 1,500 men during the Battle of San Jacinto. 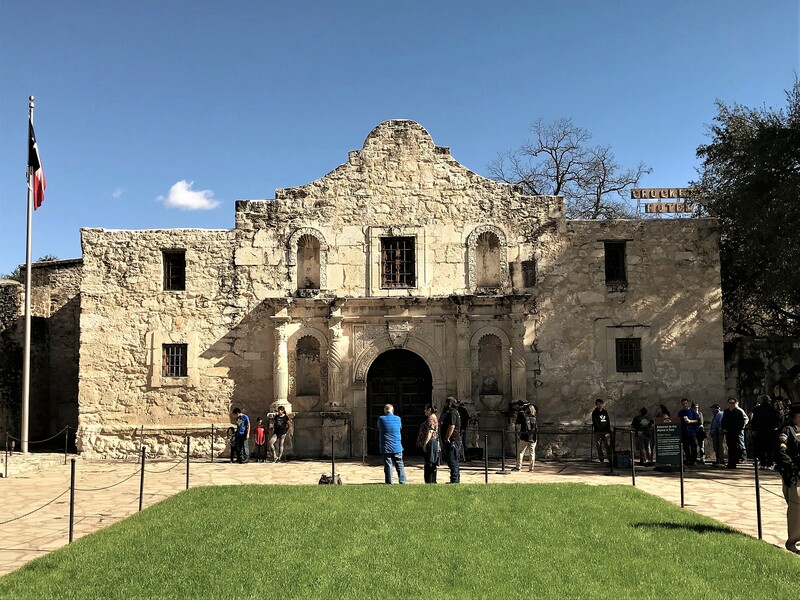 They then drove the Mexican Army south from the newly established Republic of Texas, which is basically the border line between the US and Mexico we see today, and the Texans once again occupied The Alamo. 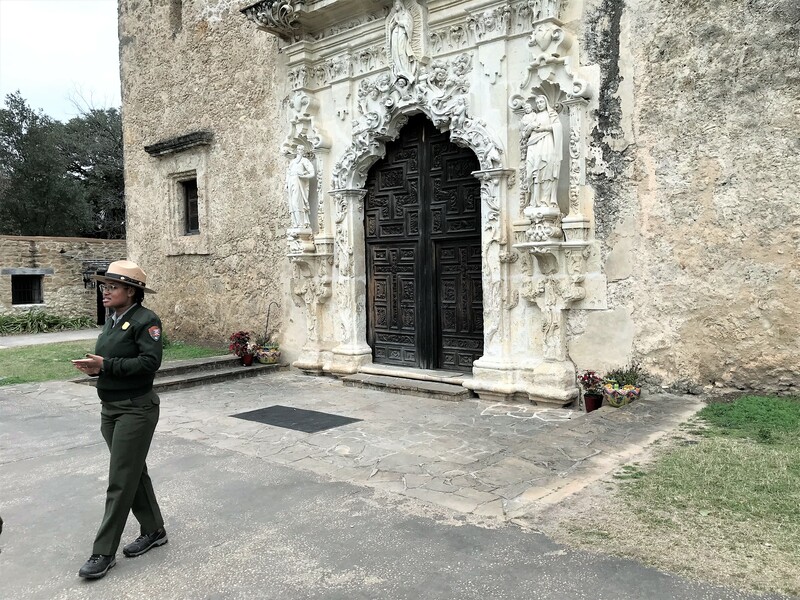 Admission to The Alamo is free, but photography inside is prohibited, which I found odd until one of the rangers explained that many of the artifacts were on loan from private collectors…including the musician Phil Collins. 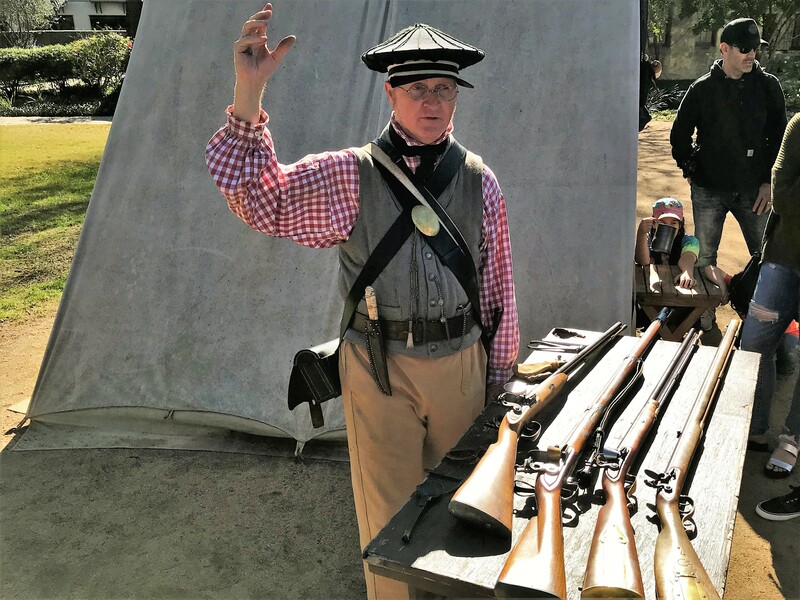 Yep, even though a British citizen, he has an intense interest in the American history and, according to legend, believes that in a former life he was a patriot fighting at the Alamo. …including this field doctor who described the primitive health care of the day. A very nice living history lesson of American history during a pivotal time. 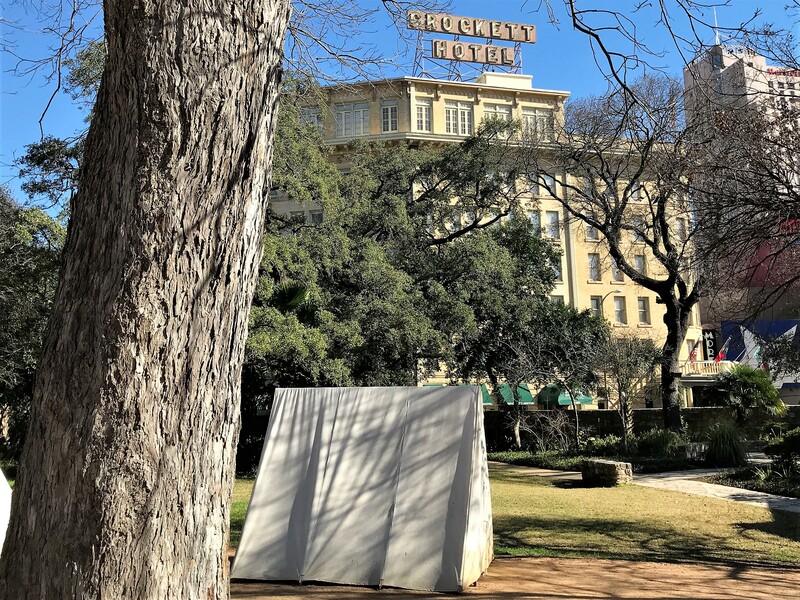 Stepping out of the Alamo grounds brought you suddenly back into the 21st century. With the commercial high-rise buildings looming over the diminutive Spanish mission of The Alamo. A great day in a great city with great friends…thanks folks for sharing the day with us! 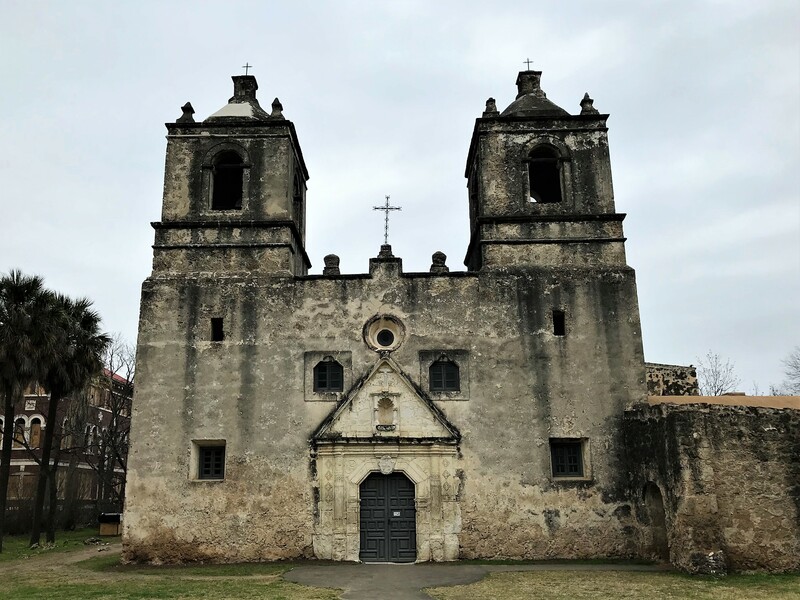 Since we so enjoyed touring The Alamo, and since we have explored many other Spanish Missions in California, Kit and I took a day to seek out the other four missions arrayed along the San Antonio River…all of which are managed by the National Park Service and have been designated World Heritage Sites. 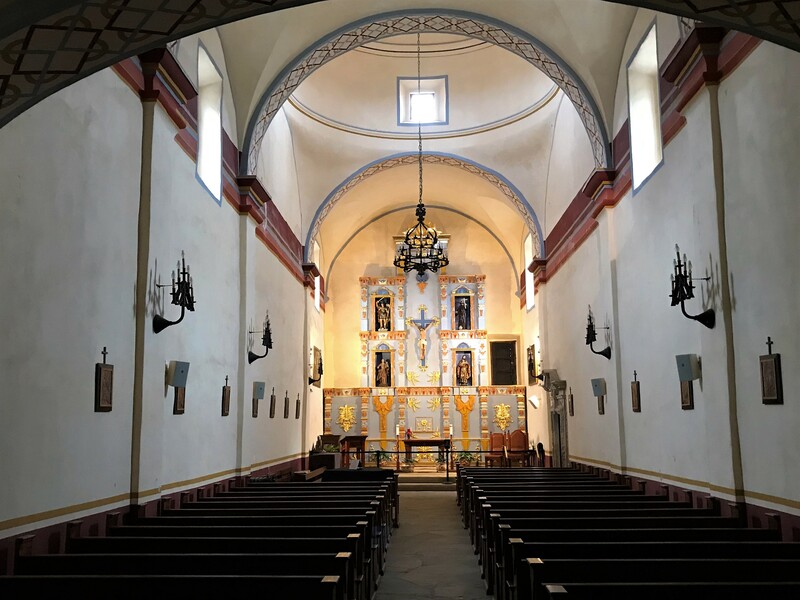 Starting from the most southern, we stopped at Mission San Francisco de la Espada. Dropping into the visitors center we met a very pleasant ranger by the name of Tatum. Yep, her mom loved the movie Paper Moon! 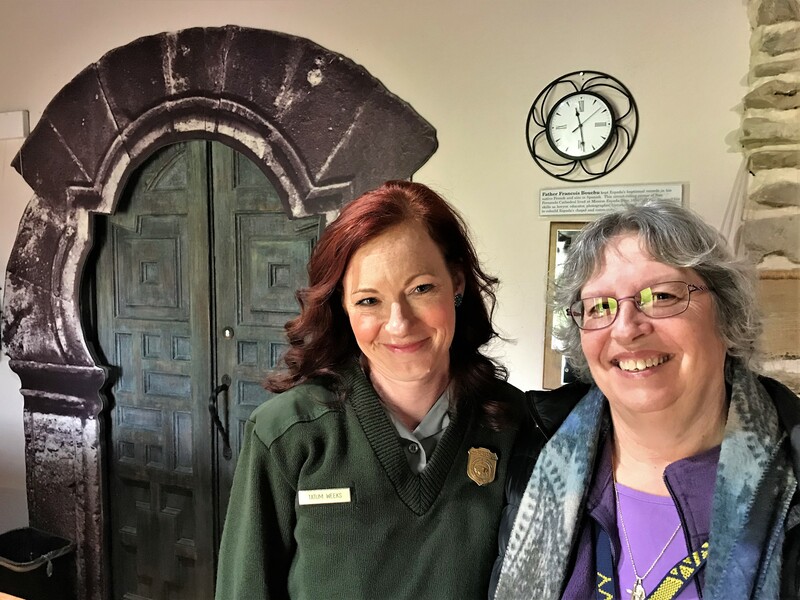 We were her only visitors, so Miss Tatum spent a good deal of time describing life in the 15th century and explaining the Spanish mission system. 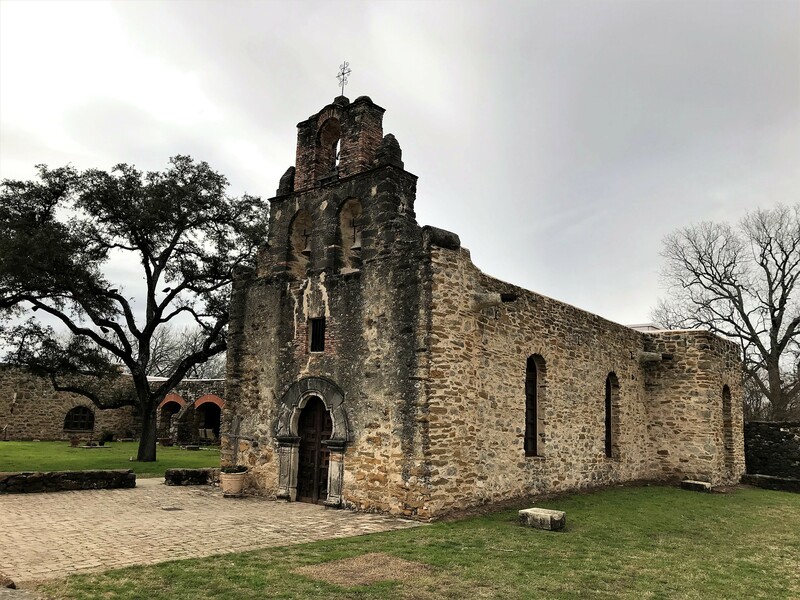 This first mission in colonial San Antonio was built in 1690 in response to the discovery of a nearby French settlement encroaching from Louisiana. 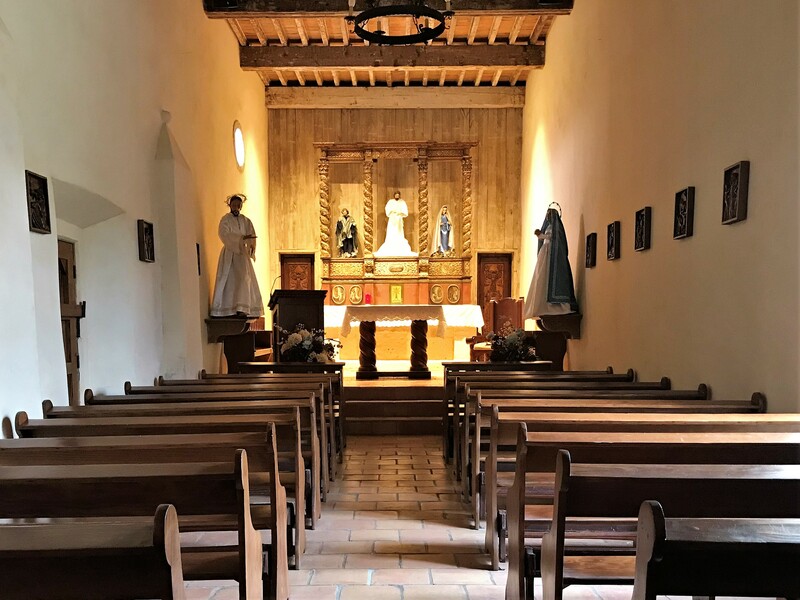 The mission chapel, as were all the missions of the time, was protected by sturdy walls with small pueblos built along the inside perimeter for the missionaries and the converted native people to live. This Catholic Church is active to this day and open to the public when services are not being held. …and this stop was no exception. The next mission north was Mission San Juan Capistrano. 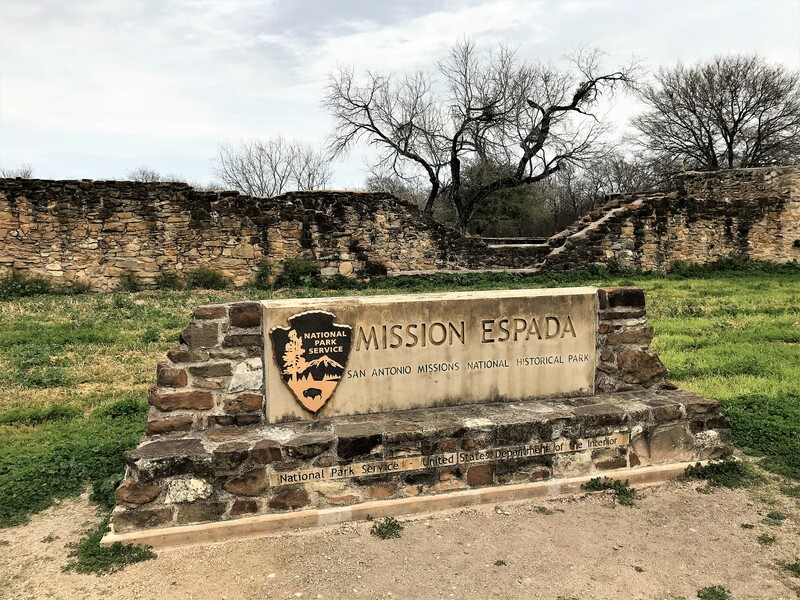 This mission complex was more isolated and was frequently attacked by Apaches, so a squad of Spanish soldiers were housed within its walls to help protect the missionaries and the converted natives. 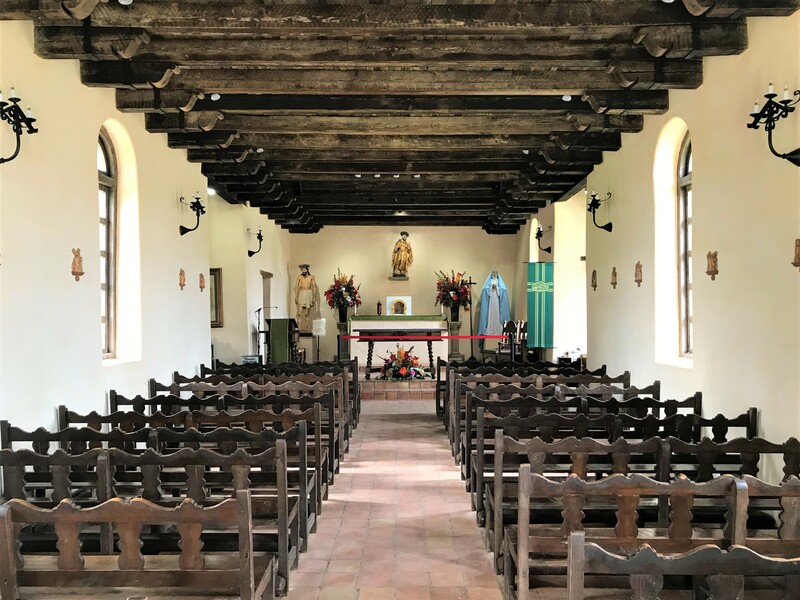 Mission San Juan is also an active church…however its chapel is much smaller than the others. 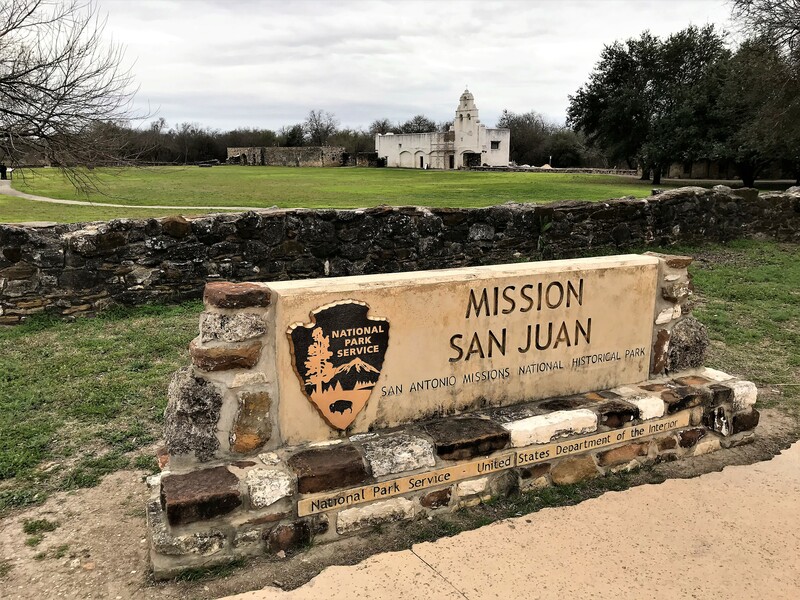 Next along the Mission Trail is Mission San Jose y San Miguel Aguayo. …what a delightful and very knowledgeable young lady! 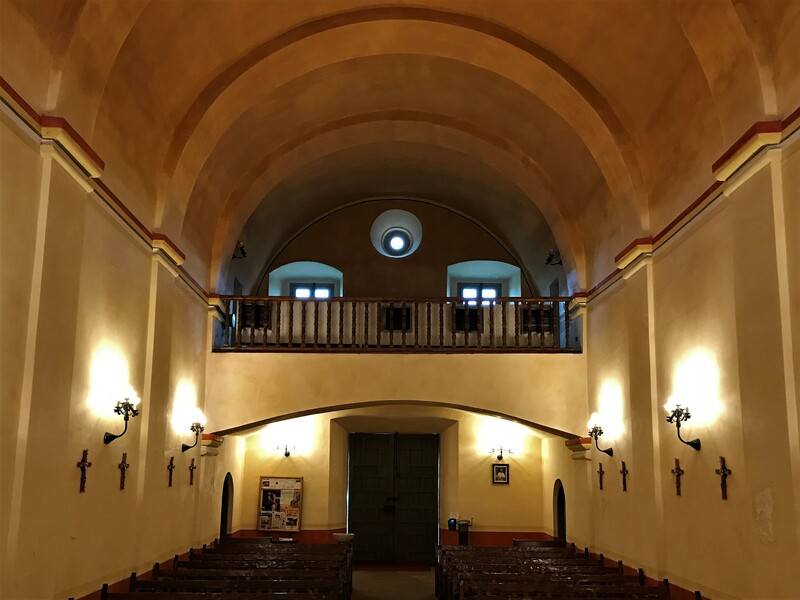 The largest and most complete mission of the five, Mission San Jose had the capacity to house 350 native peoples in rooms built into the perimeter walls. The platform above the massive double doors in the photo above once held cannons for protection against marauding natives. …and the interior was larger and more ornate than the other chapels as well. 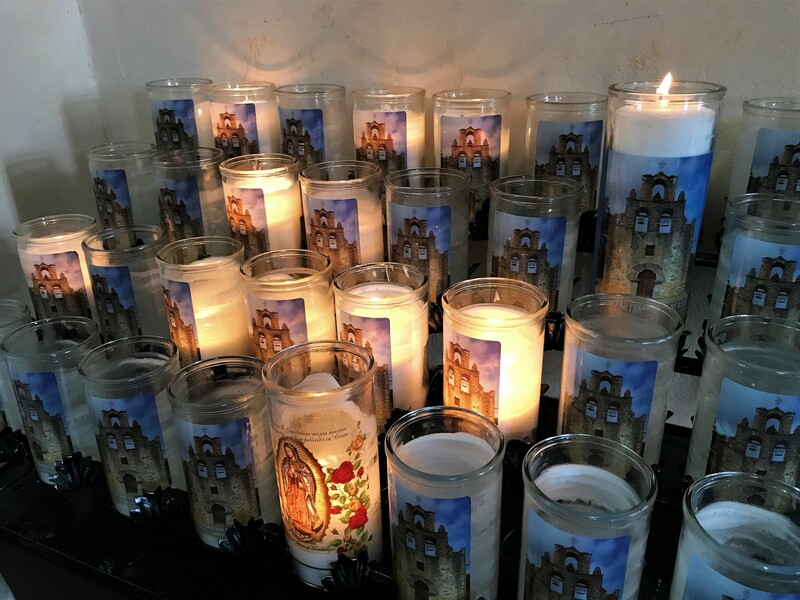 An unusual feature was the use of electric votive candles. 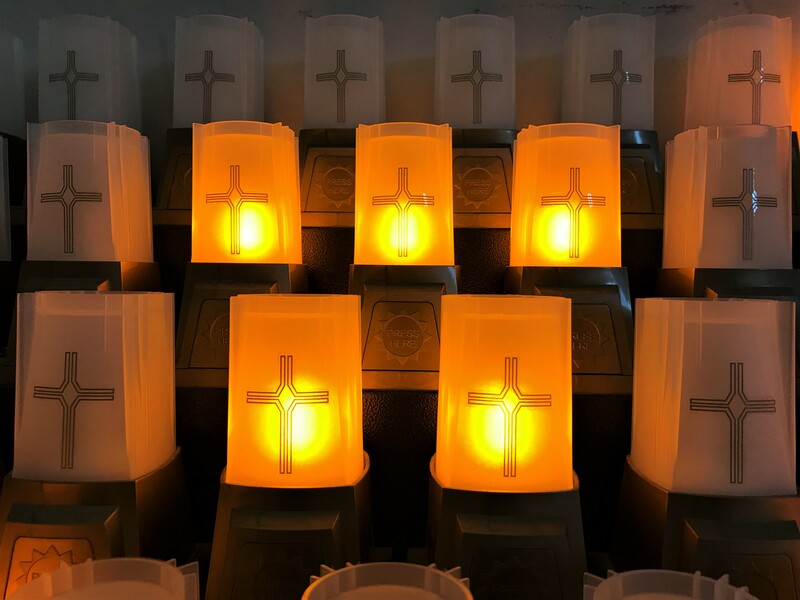 Where upon making a donation, one could push a button to illuminate the candle. A bit odd…of all the missions Kit and I have toured, this was the first one that did not allow candles burning. This place is huge, and far more architecturally decorative than the surrounding missions. 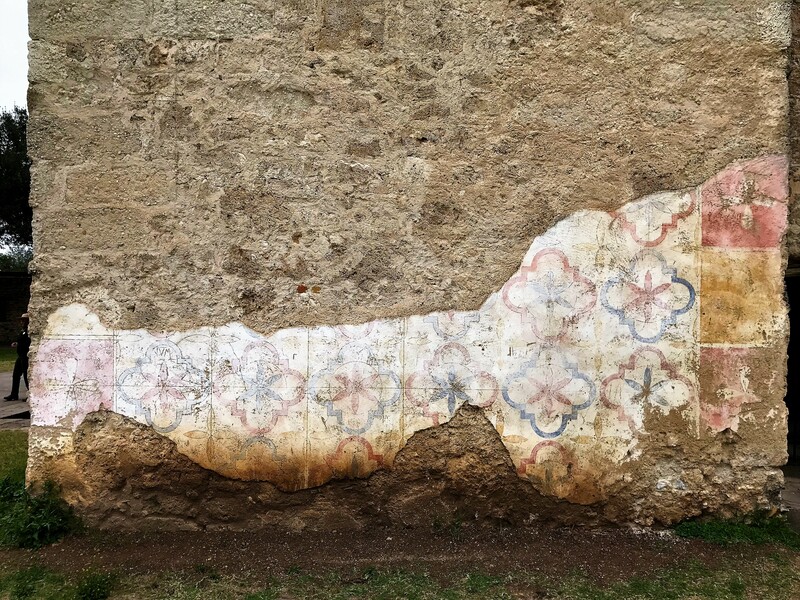 Although much of the fresco paint had sloughed off, there were a few remaining square feet that remained. 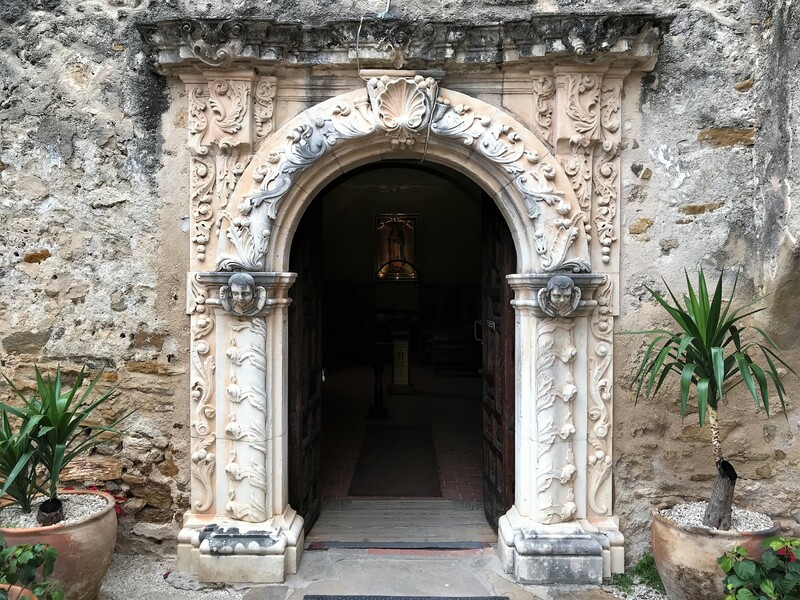 When built, the exterior walls of many Spanish missions were plastered and decorated in brightly colored designs to attract the attention of the region’s native populations. 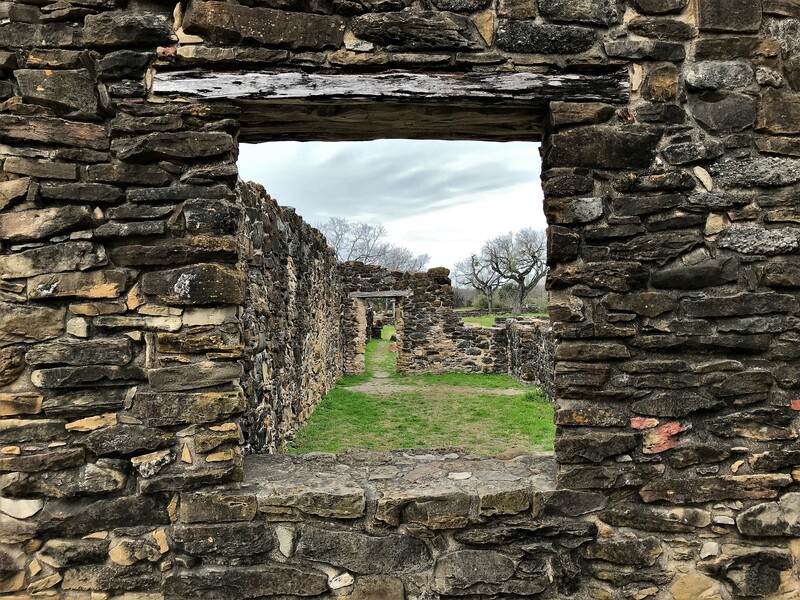 Boy, if walls could talk, this place could really tell a story of life in the era of Spanish Missions. 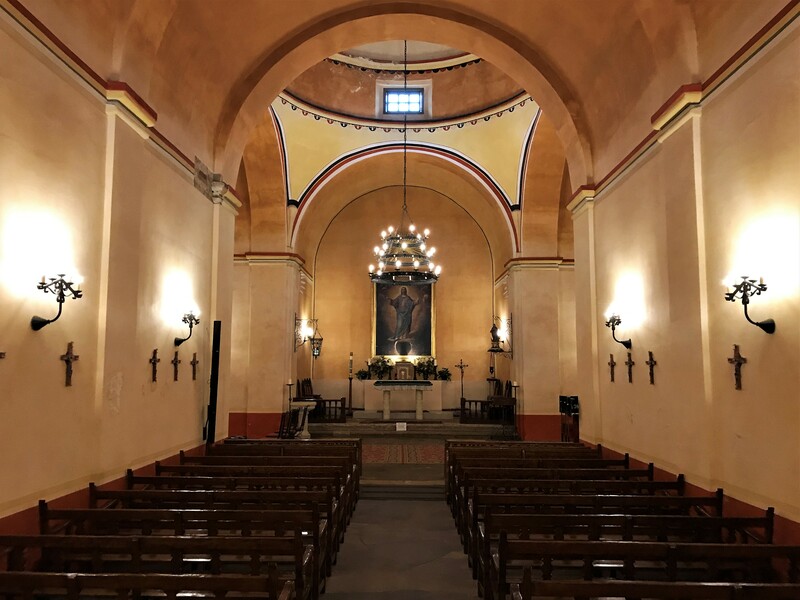 The last stop on our trek was at Mission Conception. The current church building was completed in 1755 and is the oldest unrestored stone church in the United States. It also boasts of the longest continuous active congregation of any Catholic Church in the nation. 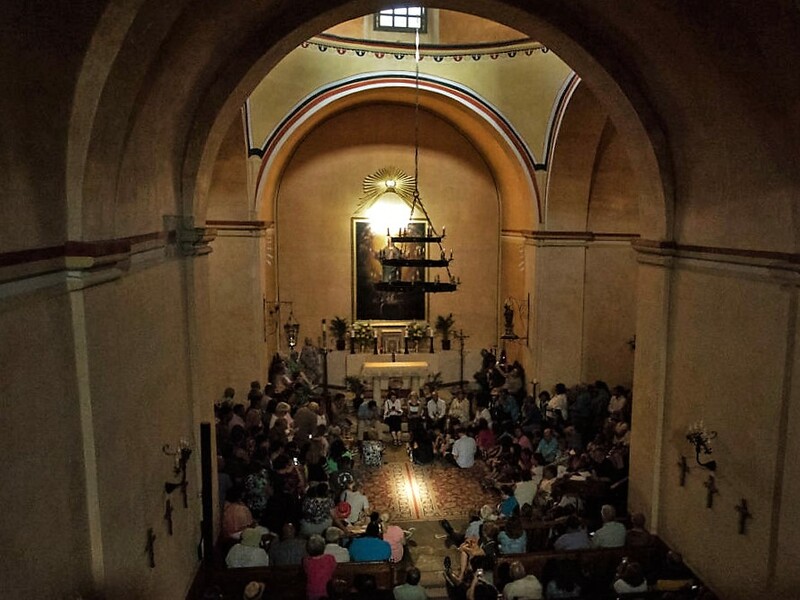 In addition, Mission Concepcion is famous for an annual celestial phenomenon known as a Double Illumination. When built the chapel was oriented west to east and windows were strategically placed to capture light from the setting sun. Unbeknown to the architects of the day however was that on one day in August, the sun would be at a precise position to focus a shaft of sunlight on the face of the Virgin Mary painting behind the alter…and simultaneously focus a beam of sunlight through a dome window on the floor of the chapel in front of the alter and at the precise intersection of the cross shaped floor. This once a year awe inspiring moment draws the faithful and curious to the small mission by the hundreds. 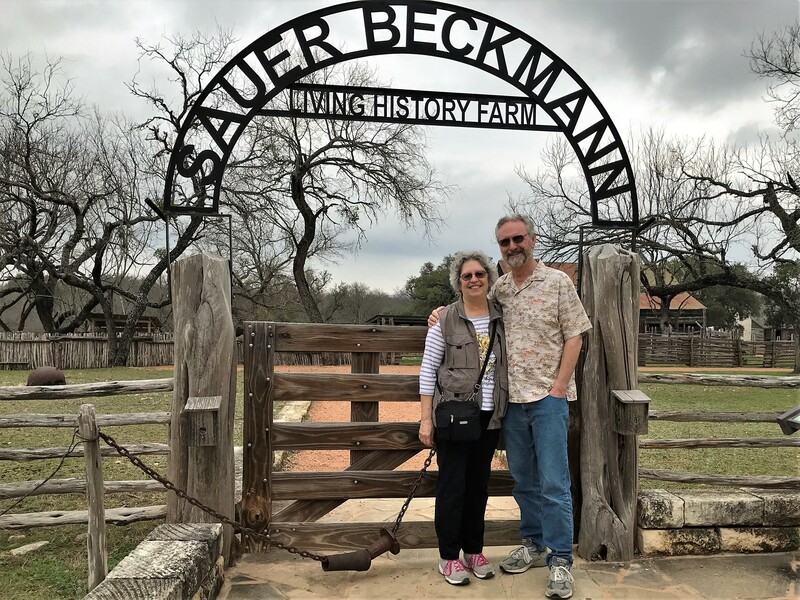 Kit and I thoroughly enjoyed touring the remaining San Antonio missions and talking to the rangers and volunteer docents. 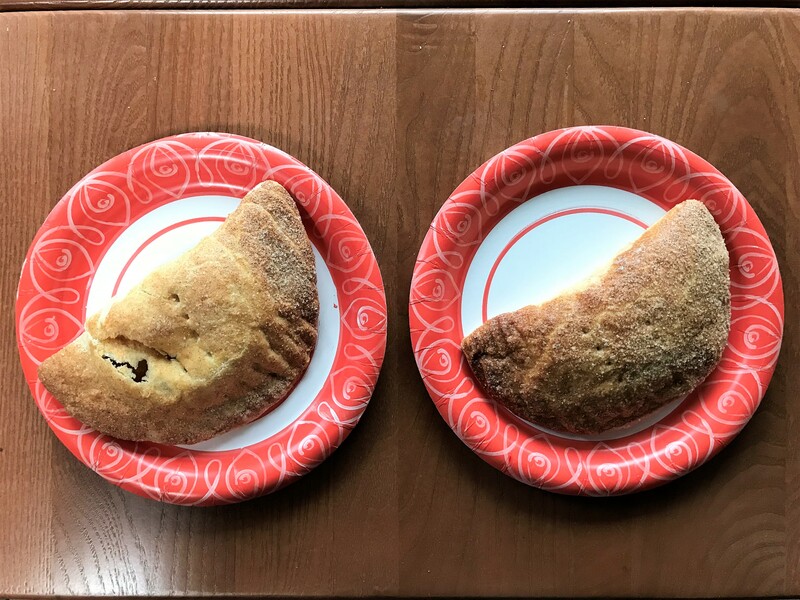 At one of the mission’s parish gift shop were some freshly made fruit empanadas which we brought back for desert. Returning to the camper, we enjoyed a fine meal and a glass of wine, as the sun set on our final day in Old San Antonio. 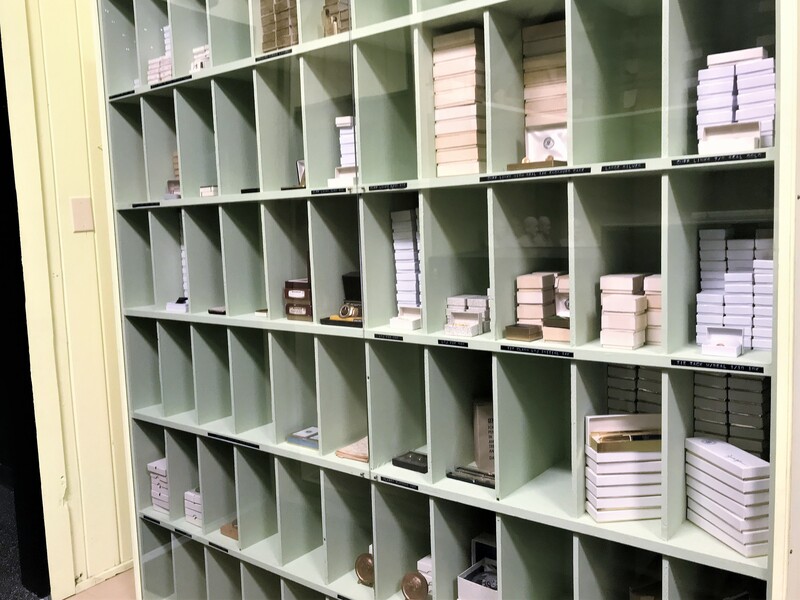 Kit’s Bit’s: We thoroughly enjoyed our visit to San Antonio! I had wanted to return there ever since we’d visited with the kids back in 1976. Fortunately, we had perfect weather. And, it was fun touring with Rey & Darlene. They have seen most places in this area but were kind enough to accompany us and keep us from getting lost. 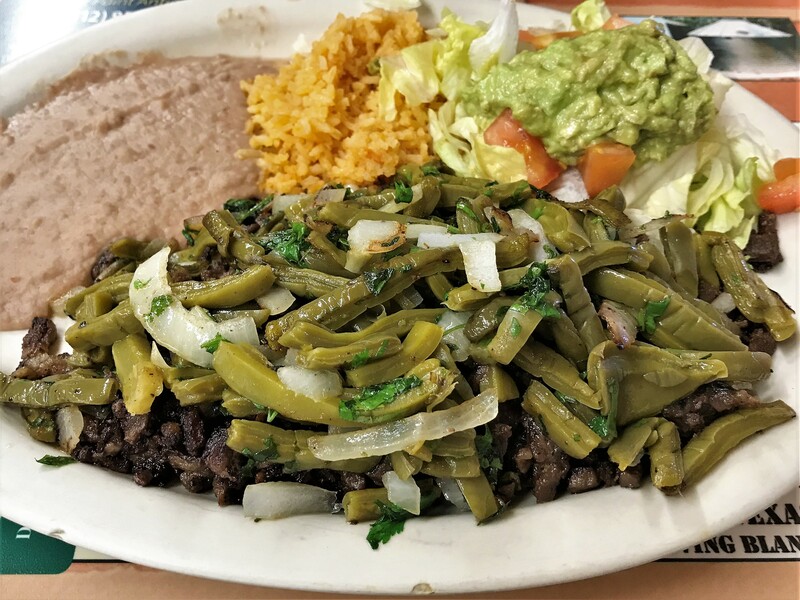 Nice to have an authentic Mexican meal, too! Sunday, January 20, 2019: At 1028 hours, Kit and I departed Rickwood Caverns State Park under partly cloudy skies and a frosty temperature of 32 degrees. We found our way onto Interstate 65 South before merging onto I-20 West passing through Bessemer, Alabama an hour later. At 1311 we encountered the Mississippi state line and after a brief rest stop at their welcome center, motored on the west. 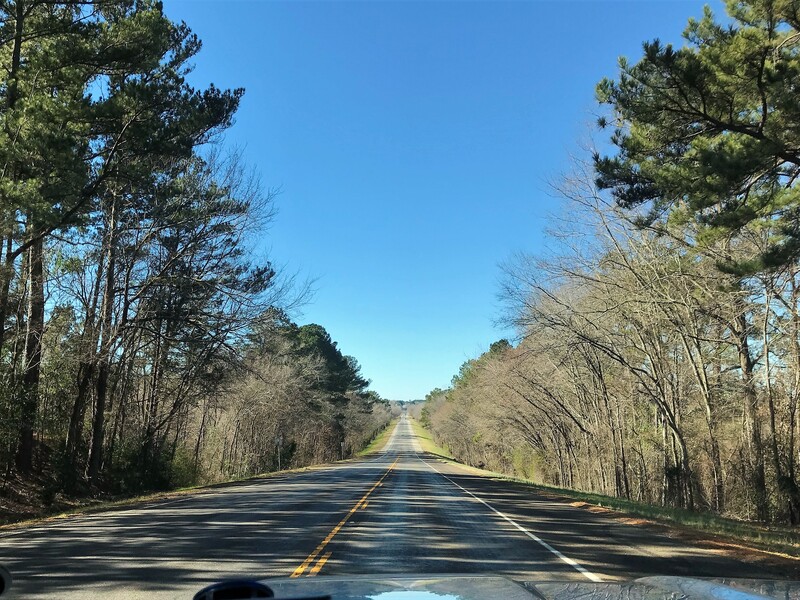 Approaching midafternoon, Kit started her daily internet search for an overnight stay and found a promising Mississippi State Park near the town of Morton, MS. Calling first to see if there was room for us this evening, we pulled into Old Roosevelt State Park shortly after 1530 hours. And set up on a very nicely wooded campsite. As you may be able to tell, we generally leave truck connected to trailer when only staying the night…often we don’t even bother putting the trailers leveling jacks down. 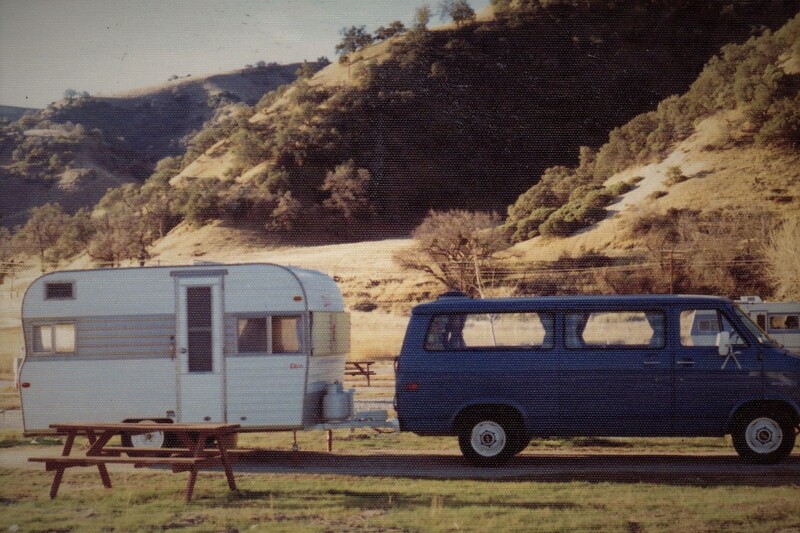 True, the camper does jiggle a bit on its springs when we walk about but nothing that bothers either one of us. We generally hook up the 30-amp power cord but sometimes don’t bother hooking up the fresh water or sewer hoses having ample fluid capacity on this style of camper. 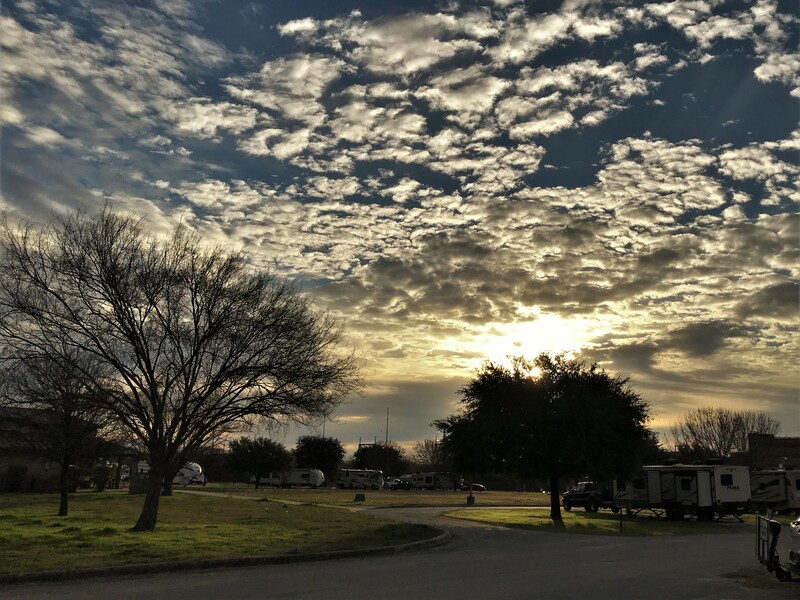 Unlike many state parks we have camped at, this place is quite large featuring 109 RV sites in two separate campgrounds, and many more primitive campsites for tents. 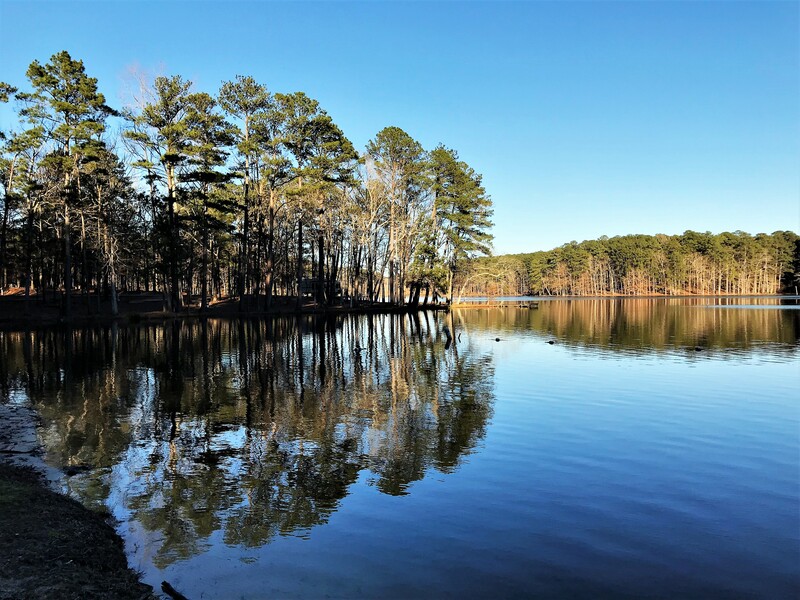 Located in the Bienville National Forest and constructed in the mid 1930’s by the Civilian Conservation Corps, the park also has cabins, a large residential lodge, a 200-seat convention center, and a 600-seat performing arts and media center! Many of these facilities are in wooded areas with views of Shadow Lake…a prime fishing impoundment for locals and visitors from away. Walking along the lake shore, I scouted a few spots to view tonight’s Super Blood Wolf Moon before returning to the camper for dinner. Moonrise in these parts was at 1905 hours so a few minutes before that time, I grabbed a flashlight and a camera then made my way through the cold evening air to the chosen spot. Where the moon rose and looked more like a sunrise…of course, just not as bright. 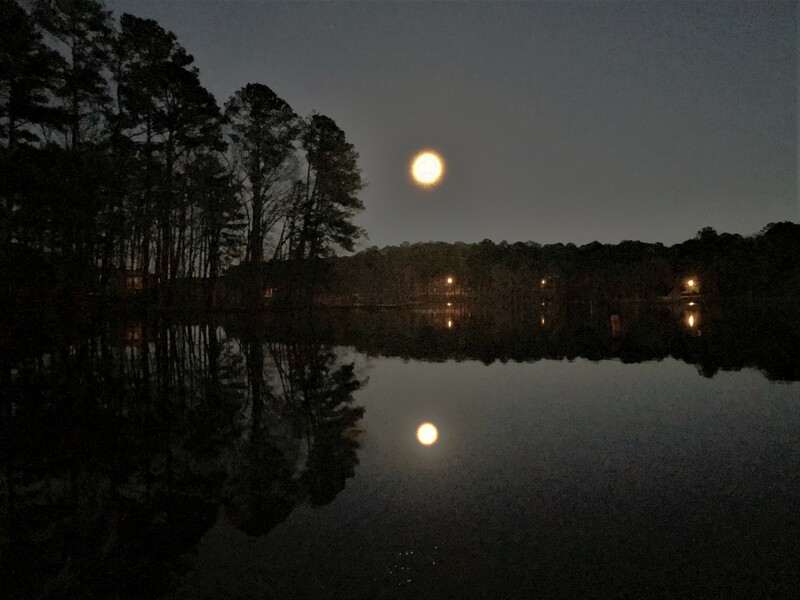 My camera does not give the image justice…it was a spectacular sight with the large orange/red moon being reflected on the surface of the placid lake. Mesmerized by the celestial event I little noticed the rapidly falling temperatures. After a while, it was time to return to the camper to seek warmth and a bit of spirit-based antifreeze…good night! Monday, January 21, 2019: As a person of a “certain age” I get up from bed a few times in the evening. Upon crawling back under the sheets, and glancing through the skylight above our heads, I noticed the full moon was part way through the predicted lunar eclipse! So, wanting to share this magical even with my life partner, I shook Kit awake. Her response? Ukjfk kls jkdslr mne! Which translates into &%$*% ^#@ #%&*@# +&* ! The view trough the plastic dome of the skylight did not produce an acceptable photo but the earths telltale bite out of the moon was quite noticeable. Up at 0630, breakfast and computer fun preceded an underway time of 1034 hours. We snaked along a few country roads and found our way to I-20 West. 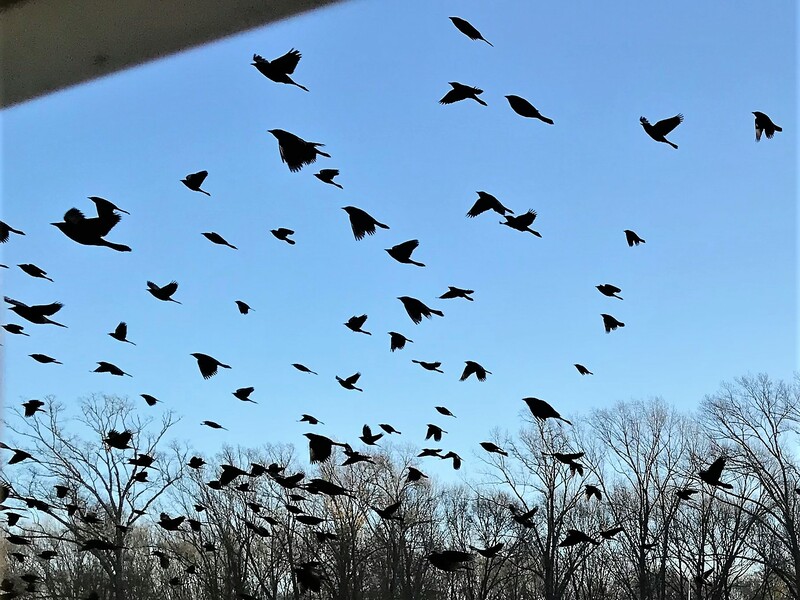 It was a beautiful bright sunny morning with temperatures in the mid 40-degree range. 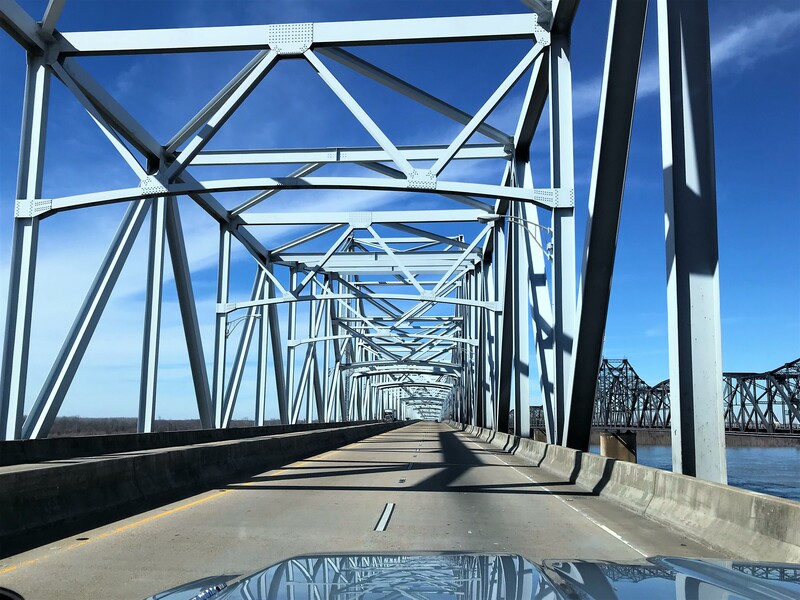 …and entering the state of Louisiana. This river has been our self-designated demarcation point between East and West. Kit and I are not sure how much farther west we will travel this year before diving to the south. Since we left about five weeks later than in the past, and since we want to return home earlier than June, it is unlikely we will travel all the way to the west coast as in previous Excellent Adventure trips…time will tell. After a quick rest and lunch stop at the Louisiana Welcome Station, we continued west on I-20. 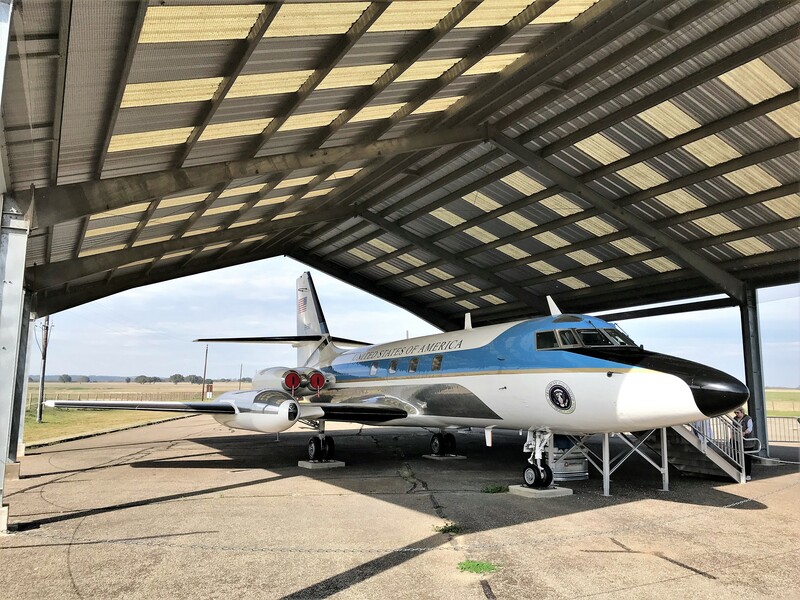 Kit started looking for places to overnight and suggested Barksdale Air Force Base a few hours down the highway and just east of Shreveport, Louisiana. Calling ahead to ascertain availability, we pulled in to their Famcamp (Family Campground) at 1520 and set up on a nice site in the new recently expanded portion of the Famcamp which was sparsely populated as you can see. 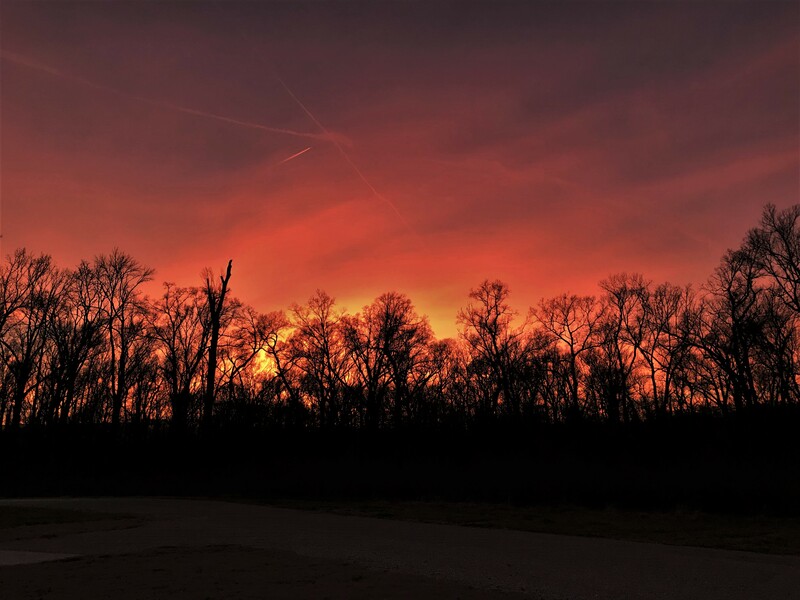 Following a walk about, dinner, and a nightcap, Kit and I enjoyed the sunset across the woods to the west of our site. 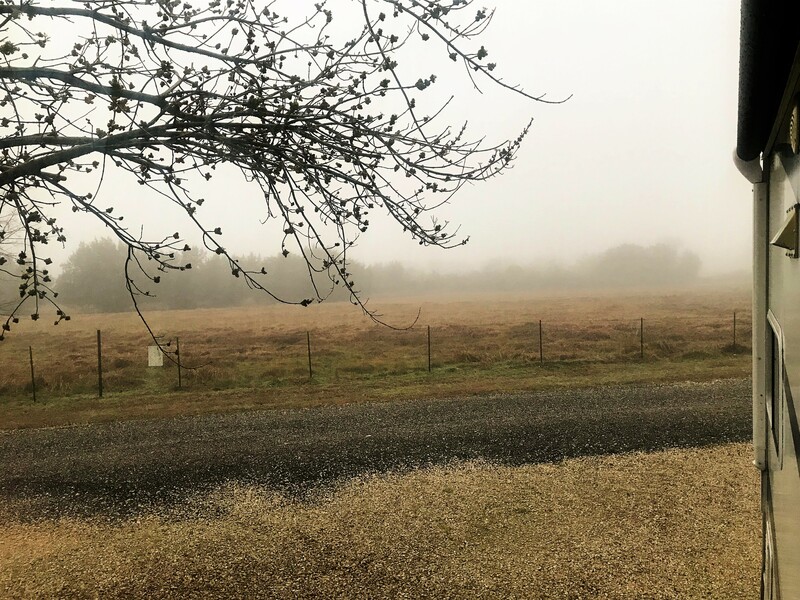 Tuesday, January 22 and Wednesday, January, 23 2019-Bossier City, LA: Decided to stay here for a few days to take care of laundry, resupplying groceries, and other domestic chores. Barksdale AFB was established in 1932 and is the oldest bomber base in the nation. 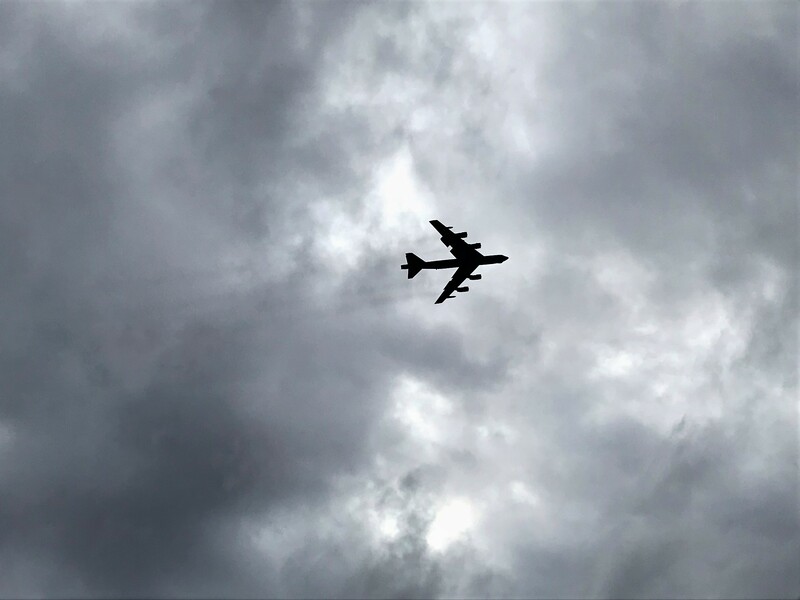 Stationed here are 15,000 Air Force and civilian personnel who fly and maintain forty-four of the nation’s venerable B-52 Stratofortress. In the aircrafts ten-year construction period, 744 were built of which 76 are still flying. 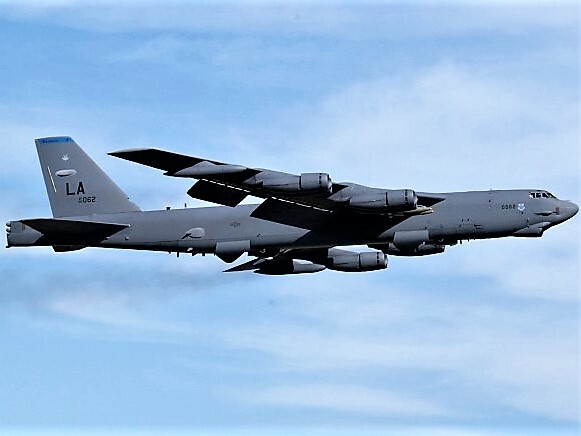 Before closing back in April of 1968, Dow Air Force Base in Bangor, Maine hosted a squadron of B-52 bombers flying aloft over the Atlantic during the Cold War period. Our campsite was near the airfield, so we were witness to many B-52 flyovers. The B-52’s first flight was in April 1952, and it’s predicted end of service life has been extended to the year 2045. That’s nearly 90 years folks…an unprecedented operational life for any aircraft! Prior to B-52’s, the B-17 Flying Fortress, B-24 Liberator and B-25 Mitchell were all flown out of Barksdale AFB. In addition to this important bomber, there are also inflight refueling aircraft stationed at Barksdale, and other support aircraft such as this squadron of B-1RD’s. Nice layover at Barksdale AFB, but tomorrow we must start south in search of warmer weather. 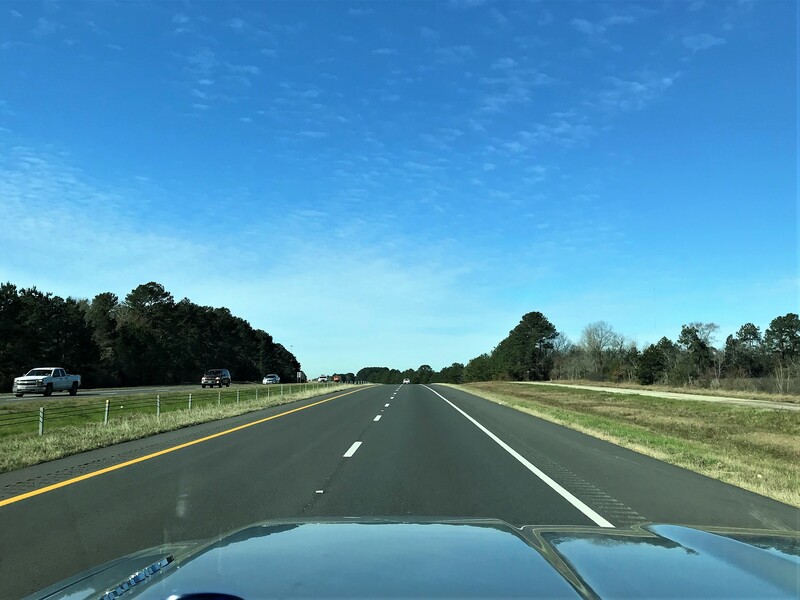 Thursday, January 24, 2019: Departed Barksdale AFB at 1008 under clear cool skies and wound our way back to Interstate 20 heading west through Shreveport, Louisiana. 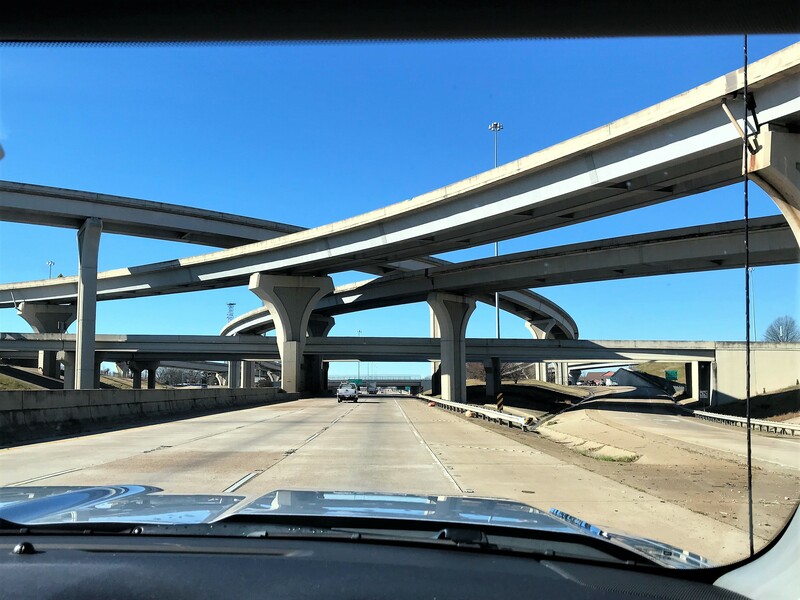 Within the hour we crossed over the Texas state line and began heading on a more southerly route via various Texas State Highways. 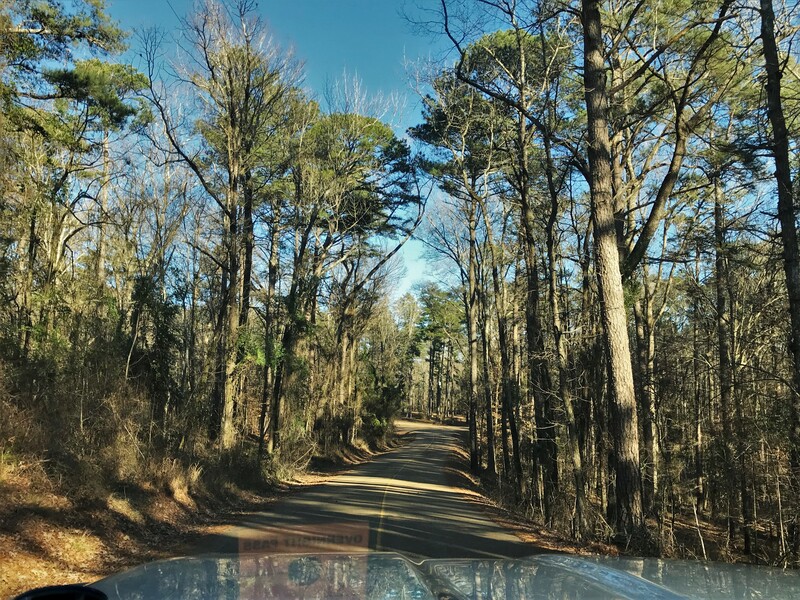 Kit and I much prefer the back roads of America, the so-called Blue Highways, as it allows us to see the true character of the United States and meet some wonderful local folks. 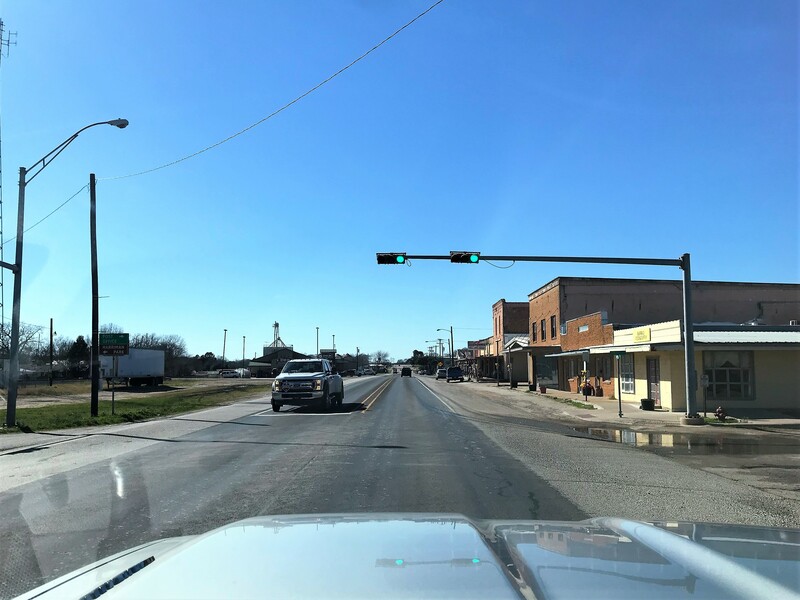 Many towns, especially in this part of Texas, are barely hanging on despite the robust economy of the country. There are many boarded up storefronts and little commercial activity along main street. These downhome and economically disadvantaged folks are likely one of the root causes that the 2016 election went the way it did. Then there are the communities that appear to be unusually moody. …well, except for the occasional steer that meanders across the highway in this area of free-range pasture land! 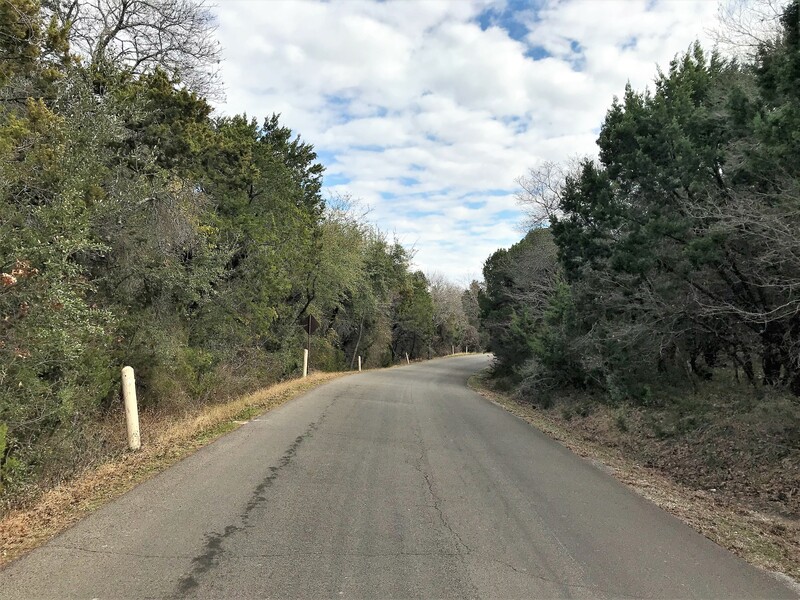 As we neared Austin, Kit called the lakeside campground of Belton Lakes Outdoor Recreation Area…a Fort Hood Army Post recreation facility known by its acronym BLORA. Fortunately, they had room for us, so off the highway and down a few country roads we went. Checked in and set up in a nice large campsite for the evening. A bit of walking around, followed by some dinner and vino, followed by a bit of reading, and off to slumber-land…goodnight. 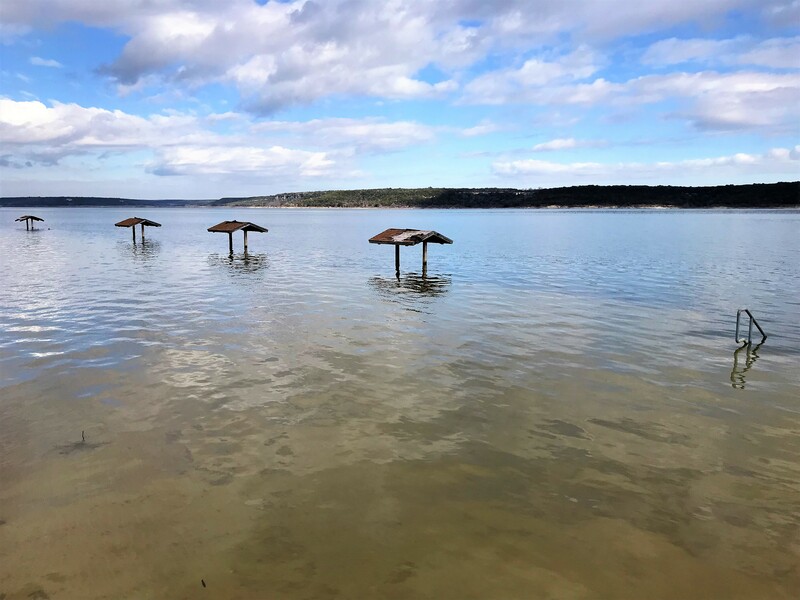 Friday, January 25, 2019 Belton Lakes, TX: The last time we camped at BLORA was during a draught year and the lake was extremely low. 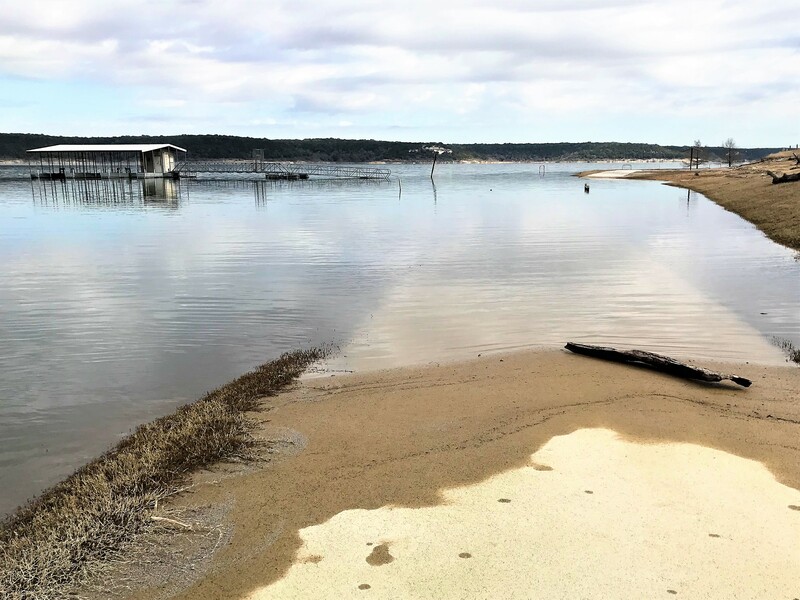 All the fishing and marina piers were sitting on mud and the concrete boat launch ramp was a good 100 yards from the water…not this time! 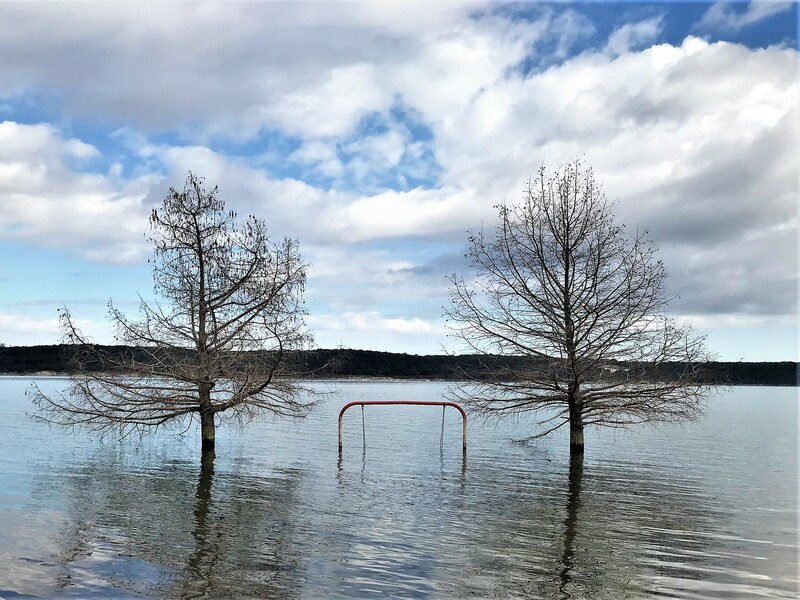 In the photo above what looks to be a boat ramp, is actually a road…you can see it disappear into the lake at the bottom of the photo and reemerge toward the top. In addition, the floating dock and ramp to the left is now yards away from its submerged parking lot and land access. …as well as the lawn swings! I bet kids would have fun trying to swing on that, if it wasn’t so cold. As I walked along the shoreline, this little fellow joined me. Tame and totally unafraid, I’m guessing he associates humans with being a soft touch for snacks! 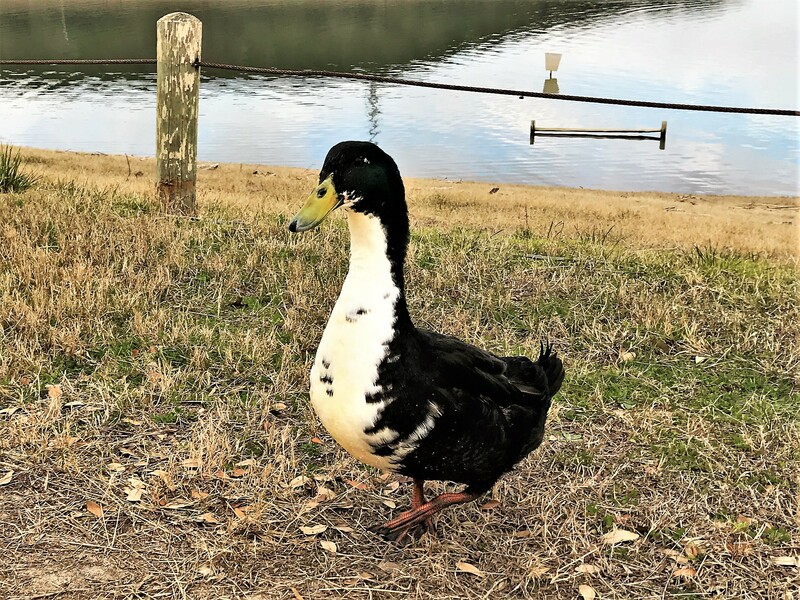 However, I didn’t have anything to offer him, so he quickly lost interest in being my friend and waddled off to panhandle elsewhere. 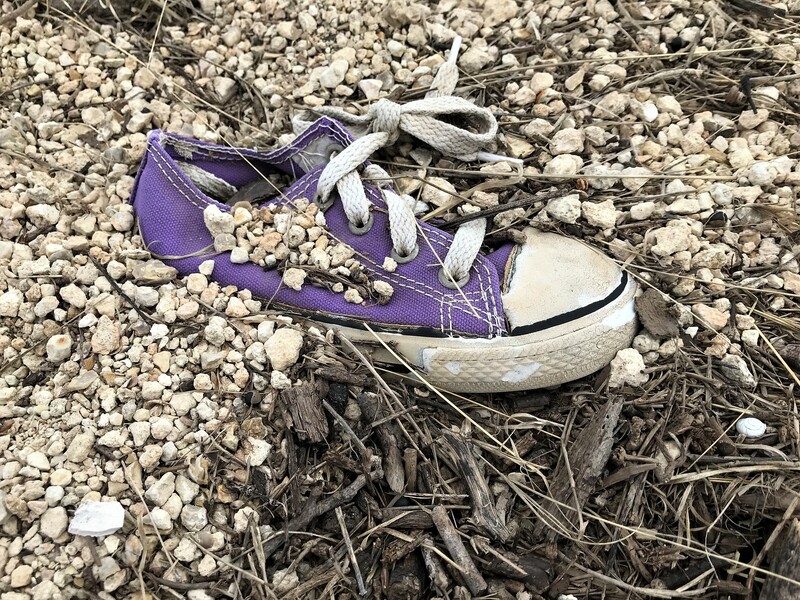 Amongst the flood induced various flotsam and jetsam items scattered along the lakefront was this forlorn tennis shoe. I’m betting some child was in a heap of trouble when he/she arrived home from a day at the lake sans one shoe. 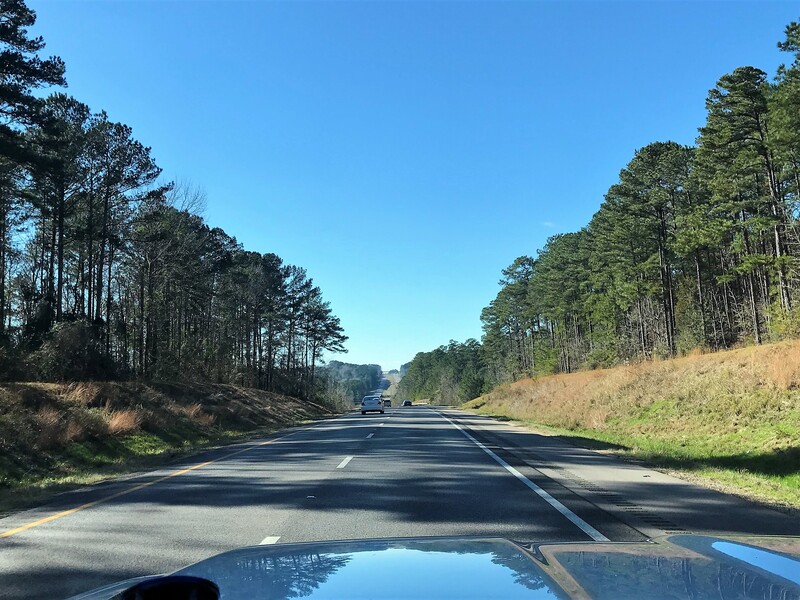 Saturday, January 26, 2019: Up and on the road at 1016 under sunny skies with temperatures in the low 50-degree range. 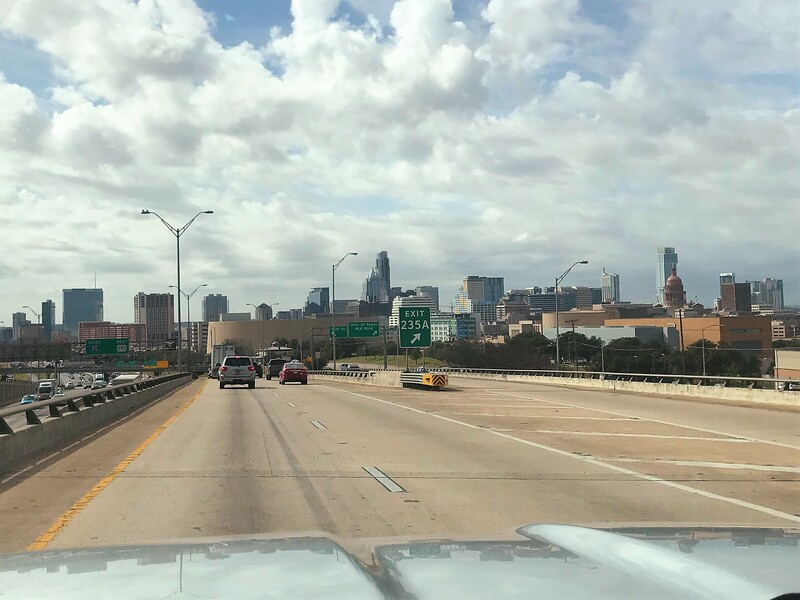 We’ve decided to head south on Interstate 35 toward for San Antonio by way of downtown Austin. 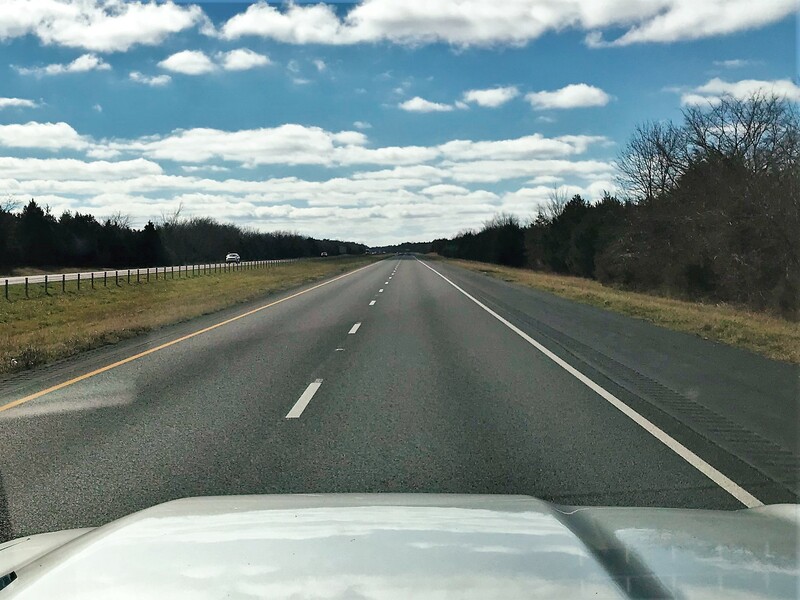 Being a Sunday, it wasn’t too congested…however everyone on the highway was exceeding the posted speed limit of 75MPH and we were poking along at our customary 60 MPH…yikes! 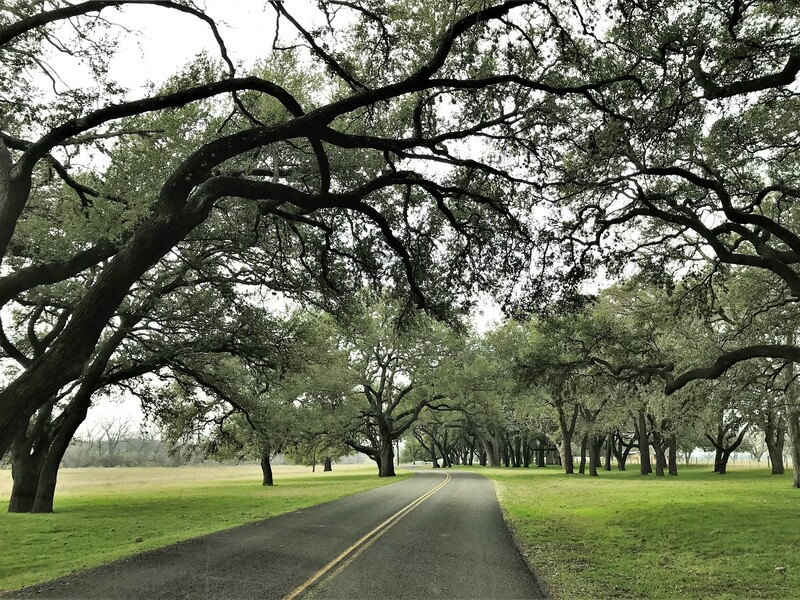 Our plan was to stay at Fort Sam Houston Army base for a few weeks in order to explore this corner of South Texas. 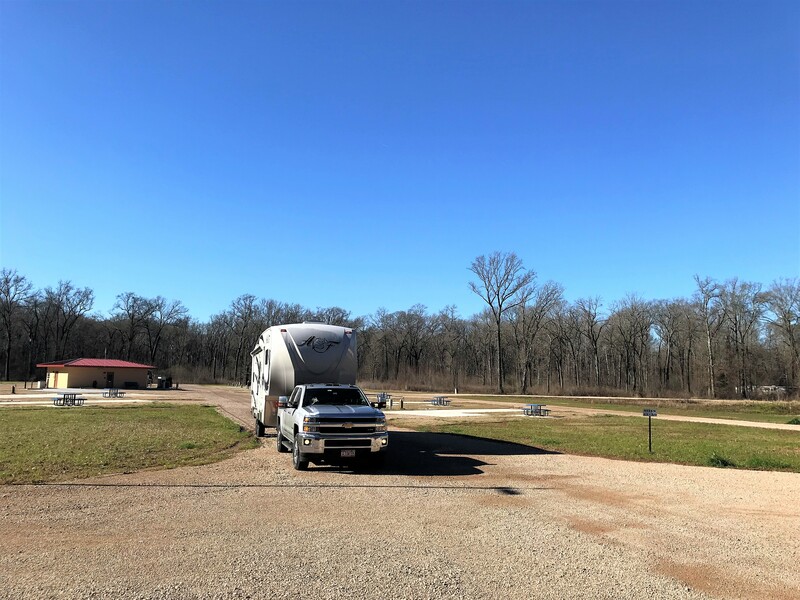 Historically, we’ve had little trouble scoring a site at this large military campground, however this year there was only one site available and that was for only five nights! 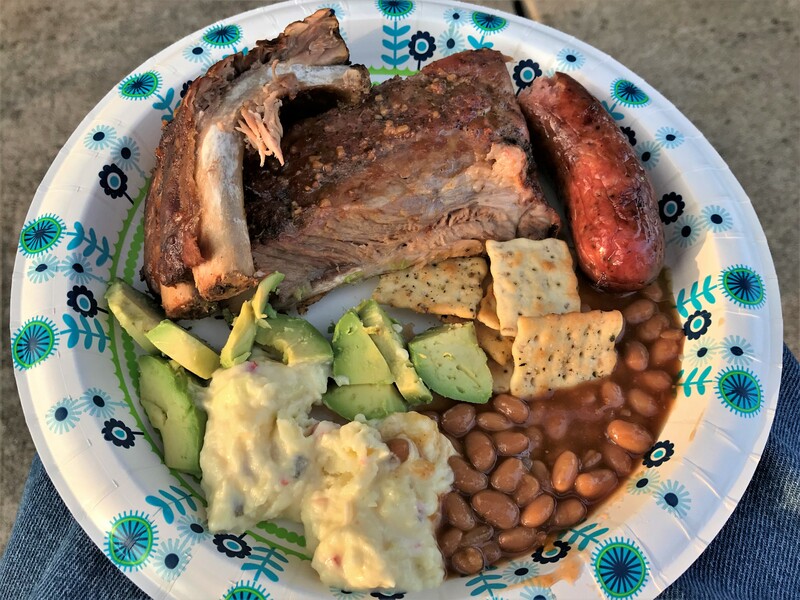 We quickly found out that the National Rodeo is in town and that brings a lot of rodeo fans to the area’s campgrounds…oh well, the chance one takes traveling without an itinerary or advanced reservation. Once on base and motoring toward the campground, we had to yield for oncoming traffic. Before setting up on a nice corner lot near the laundry…which is a good thing as we are running short of shorts! 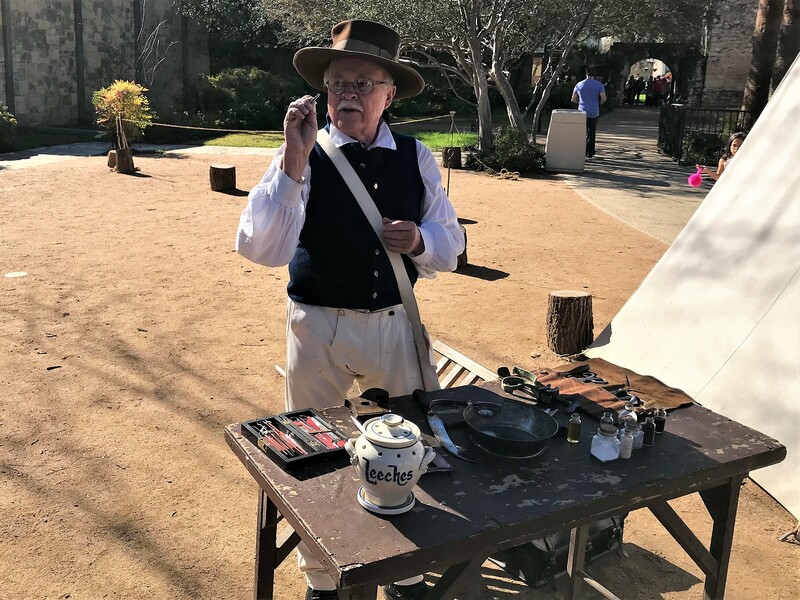 Stay tuned for the next journal…fun in Old San Antonio! Kit’s Bit’s: We’re finally in warmer weather. Not too warm, but, at least in the 50’s with a bit of humidity. Unfortunately, it’s been mostly cloudy but, it doesn’t bother me at all. We enjoyed a few quiet days and were able to catch up on household chores. We’ve camped at Fort Sam Houston a few other times and it’s never been this crowded. The one thing missing, though was wi-fi. They had it at the office only, not throughout the park. So, we had to rely on our own MiFi. All in all, we enjoyed staying here.